Yes, all good things must end. Our last week in Salcombe was full of many bittersweet lasts. We had one last dinner party, with Jan’s nephew and his wife, which included a reprisal of the Umeboshi salad. Jan had to leave the next day, which made all of us sad as we could feel it was the beginning of the end. Jan missed out on our last walk to North Sands beach, which we went on with Tim and Jennifer’s cousin Pip, her husband Steven and wonderful Alfie, the dog (North Sands is the place to walk with dogs, so we were glad to have one with us). 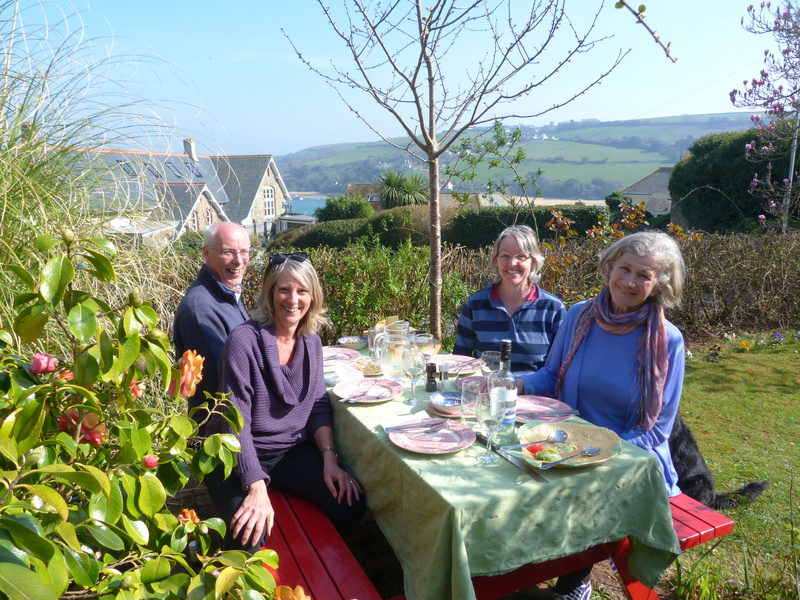 When we got back we had a perfect late lunch in the Devon sunshine, the last one out on our picnic table. We had delicious Devon cheeses and made our Salade Nicoise with our last container of hand-picked Salcombe crab. It was exquisite. Tim and I spent most of our last days writing intensively. We wanted to make sure that we were both in solid places with our books, knowing that we were going to have to leave our writing for a while. Jennifer looked after us, cooking us delicious meals while we slaved over hot computers. But we always made sure to head out for walks at the end of the day. 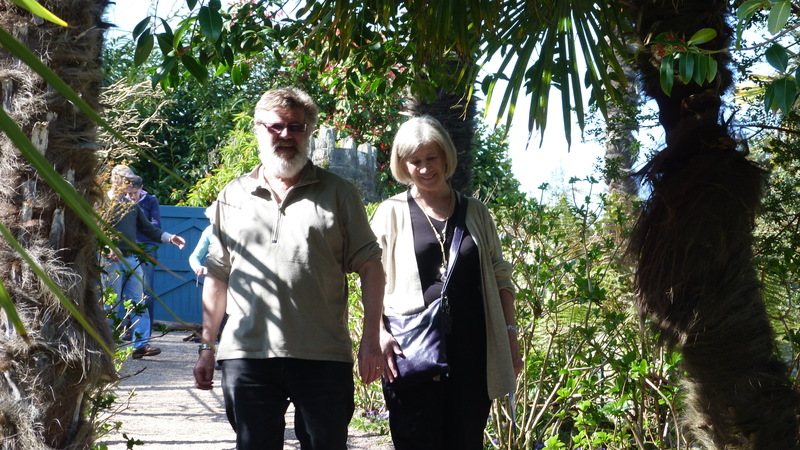 On our very last day we decided to take the afternoon and go to see the gardens at Overbeck’s. 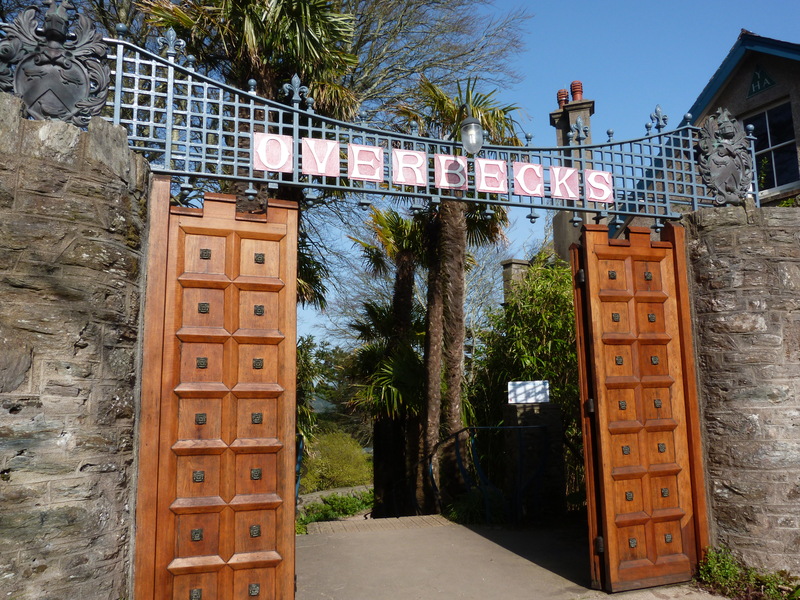 Jennifer wanted to treat us to a Devon Cream Tea, and we knew we could get a good one at Overbeck’s. The entrance to Overbeck's. Otto asked for the sign in his will. 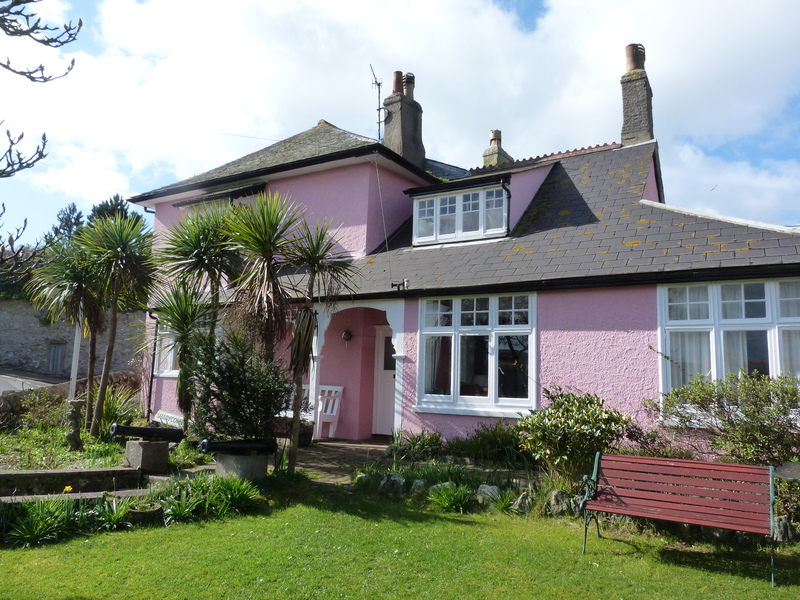 Overbeck’s is a large Edwardian house that sits on 7 acres of terraced gardens high above the Salcombe Estuary. During the First World War, the original owners, having lost their son in the war, offered their home to the Red Cross Society to be used for the treatment of convalescent troops. The “Sharpitor V.A. Hospital” looked after over 1,000 men during the war, 15 of whom ended up marrying local Devon girls. Just like something out of Downton Abbey season 2. Otto Overbeck took over the property in 1928 and lived there until his death in 1937. Overbeck made his millions on a device called “The Rejuvenator”, a machine that sent small electric currents through your body to restore health. He believed that many ailments could be cured by restoring the body’s electric balance. His “the theory of electric health” was widely read and he marketed the Rejuvenator throughout Europe. He died a bachelor and left his property to the National Trust, on the condition that it have his name on it and that it not be used as a brothel. 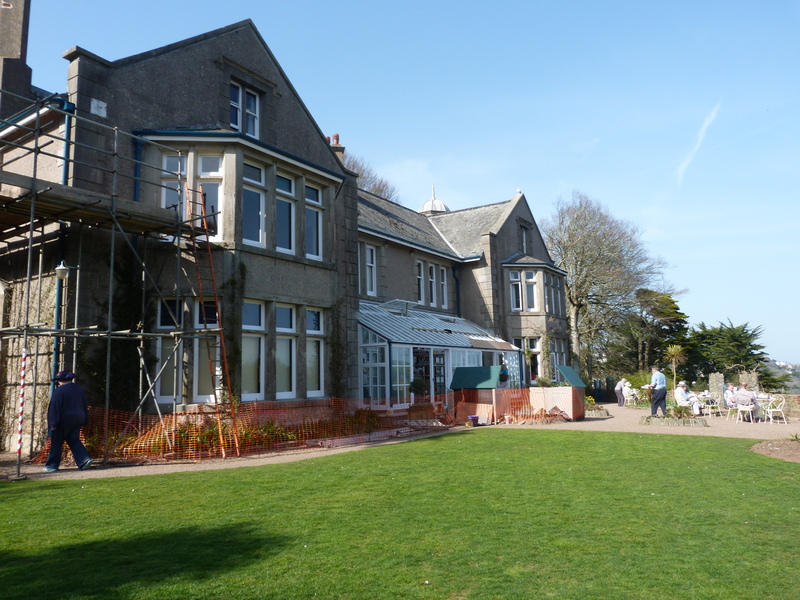 The gardens and house are open to the public during the day and turned into a Youth Hostel in the evening. Mal and Elspeth said that they used to stay there in the summers because you had the run of the house and gardens for the evening. The paths through the woods are incredibly calming and meditative. 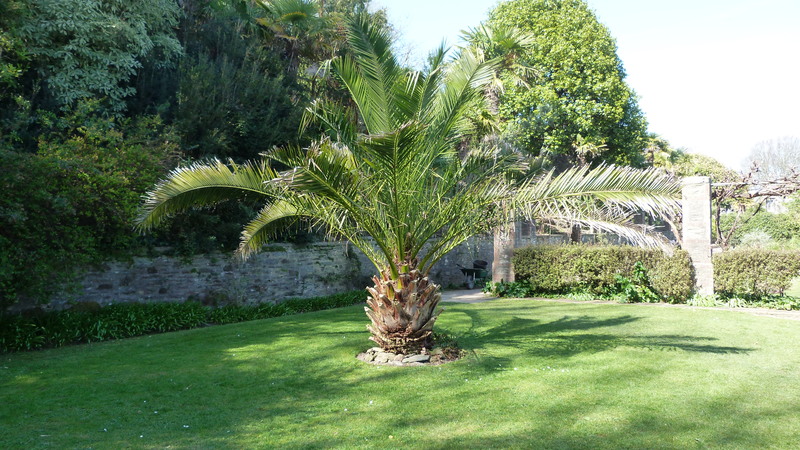 There is a beautiful little sculpture garden, a small maze and acres of unusual trees, shrubs and flowers overlooking stunning views of the Salcombe Estuary. The huge Magnolia tree, planted over 100 years ago, was in riotous bloom. The banana trees were not yet bearing fruit, but then it was just March. We were fascinated by unusual cactus trees, birds of paradise and the juxtapositions of colours and textures. It was odd to think that we had walked the coastal path just below these gardens two weeks previously. 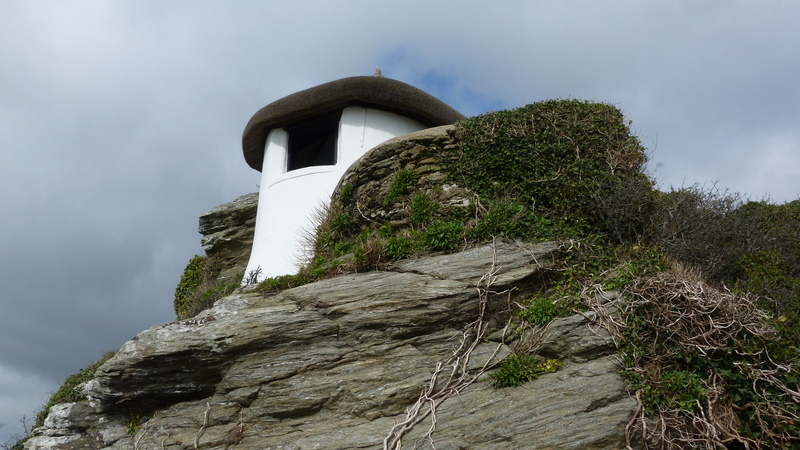 Sharptor is wild and rugged (see “Devon Coastal paths, part 2”, the rocks of Sharp Tor) and sits directly below the Overbeck gardens, which are lush and lovingly maintained. 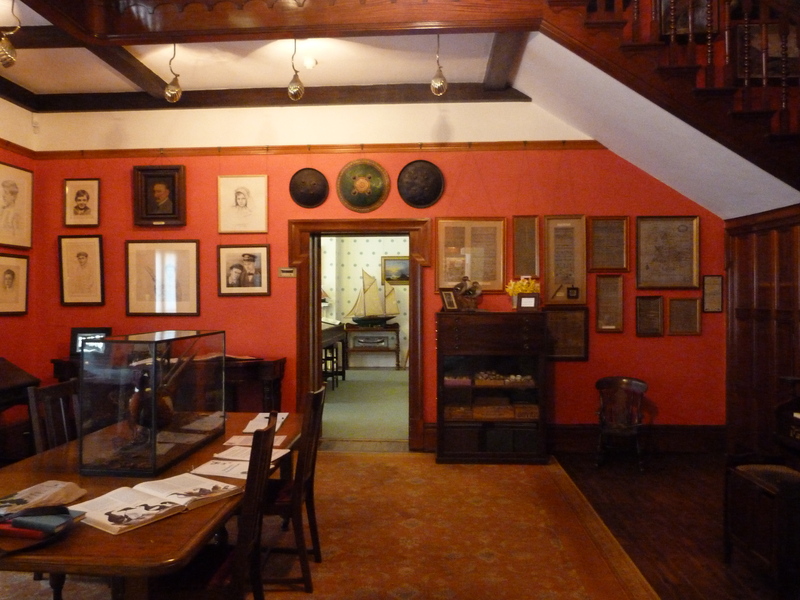 Half of Overbeck’s house is a museum filled with his collections. The rooms are steeped in the Edwardian fascination with the natural world. There are hundreds of birds eggs catalogued and on display, a practice that was common in his day but contributed to endangering many species in England. There are likewise hundreds of stuffed birds, small mammals, butterflies and shellfish. Overbeck believed in the importance of Natural Science and wanted to make sure that his collections were used for furthering the education of young people. 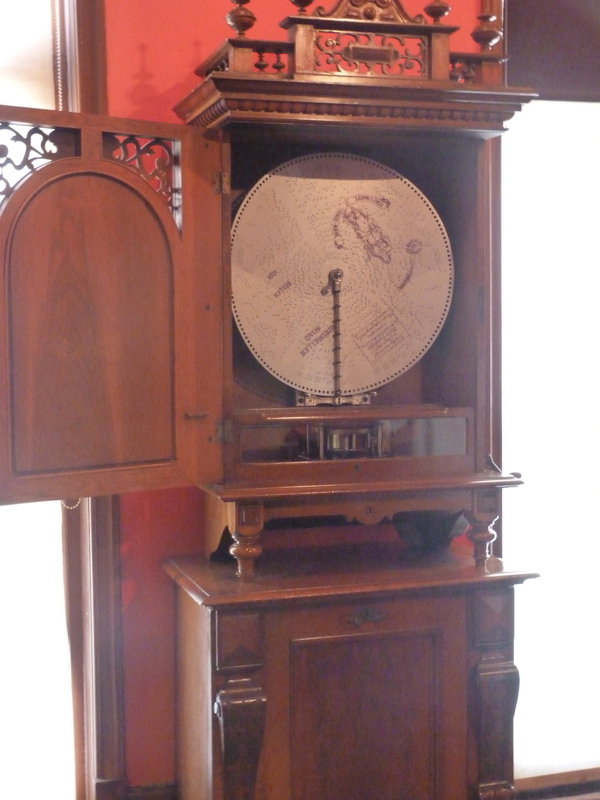 He also had an extensive collection of items about marine history, toys and a Polyphon — a huge Victorian music box. The Polyphon. The size of a grandfather clock, it turns large, thin metal disks to pluck out a tune. It is an eccentric and eclectic museum. His love of nature is manifested in his wonderful gardens, lovingly maintained to this day. A tearoom is connected to the house. 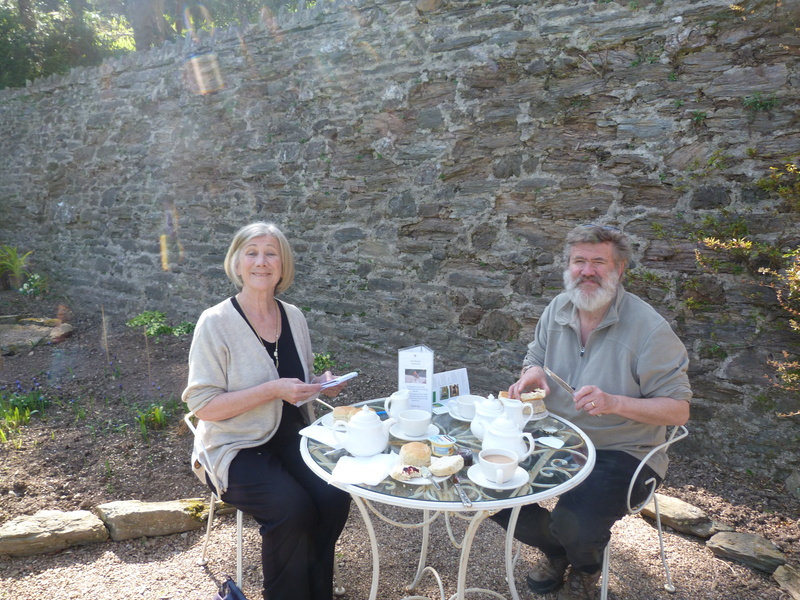 We sat outside in the spring sunshine, eating locally made scones with jam and huge dollops of Devon Double Cream, our last chance to enjoy this particular local delicacy. It was peaceful and so very, very English. After the trip to Overbeck’s there was just enough time for me to have one last late afternoon visit to Snape’s Point. I sat looking out over the harbour, and made sure to leave a small, hidden mark on a bench. Moll assured me that leaving a magic mark will ensure my return. I hope she is right. Being in Devon changed us, and I know we all want that experience again. Travelling without a car has given us very different sense of time and distance. We think nothing of walking for an hour to get somewhere that, back home, we would have hopped into a car to reach. When we decide to take a bus somewhere, it is a thrill. And if it is a double decker bus we race to the top. 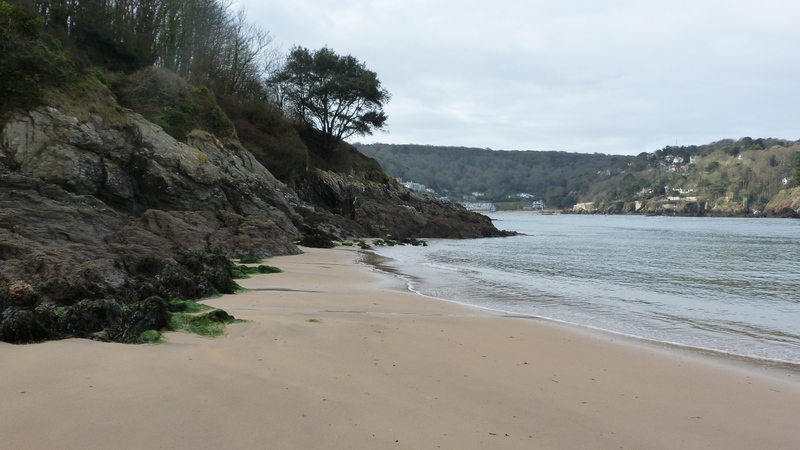 The number and variety of beaches within walking distance of Salcombe is amazing. 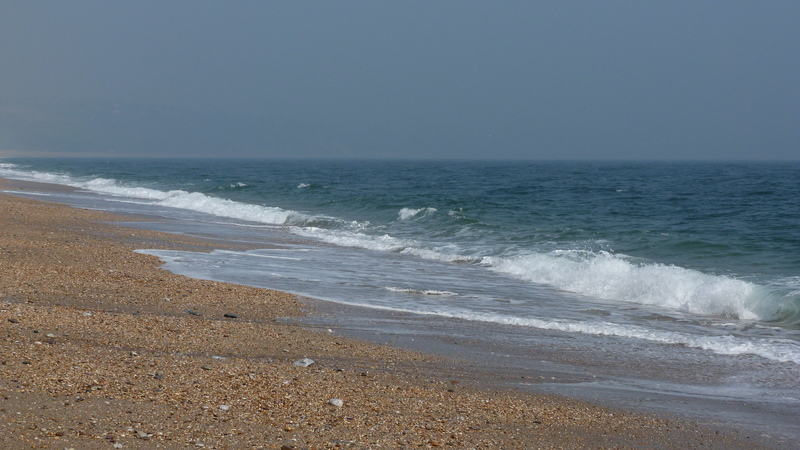 But there are also great beaches and walks that require a bit of extra travel. Jan had a couple of relatives visiting, and we all wanted to take an excursion to Torcross, in Start Bay. Six is too many for most cars, so Tim and I headed out on a local bus and we arranged to rendezvous for a pub lunch. 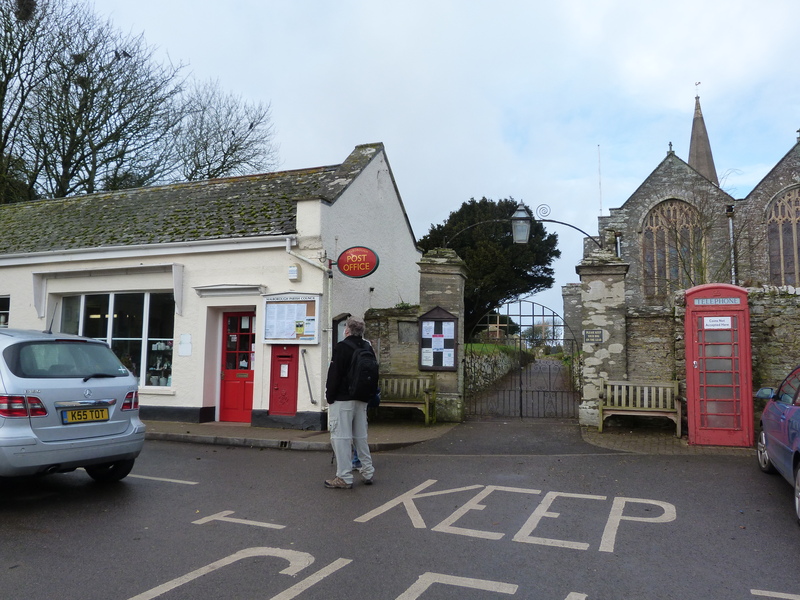 Getting to Torcross by bus was not difficult, but arriving there felt like stepping into an entirely different world. 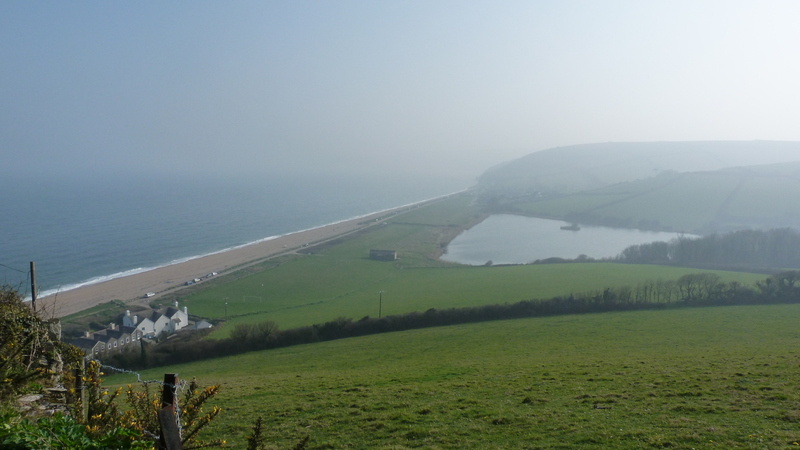 The village of Torcross is on Slapton Sands in Start Bay, a beautiful long, long pebbly beach, with gently crashing waves. The area is known for its unspoilt beauty, but also for a unique geographical oddity and an important historical mystery. 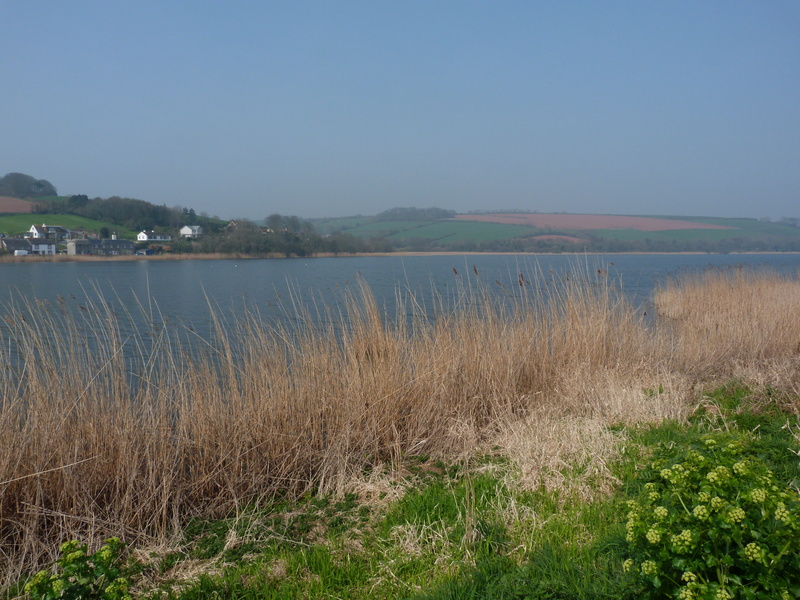 Directly beside Slapton Sands is Slapton Ley, the largest freshwater lake in South West England. There is an entirely different ecology on the lake, as freshwater fish inspire different flora and fauna. The ocean and the lake are separated by a narrow strip of land, only wide enough for a small road and footpath. On one side there is crashing surf, on the other, gently paddling swans and ducks. During WW2, this section of Devon coast was selected as a training ground for Allied Troops to practice for the D-Day invasion. Over 3,000 residents were evacuated and the area was redeveloped to recreate Utah Beach in Normandy. “Exercise Tiger” is credited for the major success of that invasion. What is less known is that the training runs used live ammunition. As a result, 308 American soldiers were killed here, practicing for the real invasion. Friendly fire. Their numbers were counted among the dead in Normandy until recent information came to light to acknowledge that their deaths actually occurred in England. The second part of this story took place on April 28, 1944. A convoy of ships was travelling from the Isle of Portland to Slapton Sands as part of the training exercise. They were unexpectedly intercepted by German E-boats, who bombed two Tank Landing Ships, killing 749 American servicemen. They were ill-prepared, as their focus was on practicing the invasion, not on meeting other ships at sea, and many of the servicemen drowned. The story was kept secret, either as a direct cover-up or just “conveniently forgotten” until an amphibious tank was found in the bay in the early 1970s, by Devon resident Ken Small. He spearheaded the creation of a memorial to honour those men killed in Exercise Tiger. In actual fact, many more men died in Devon, in Exercise Tiger, than in the actual D-Day invasion in Normandy. 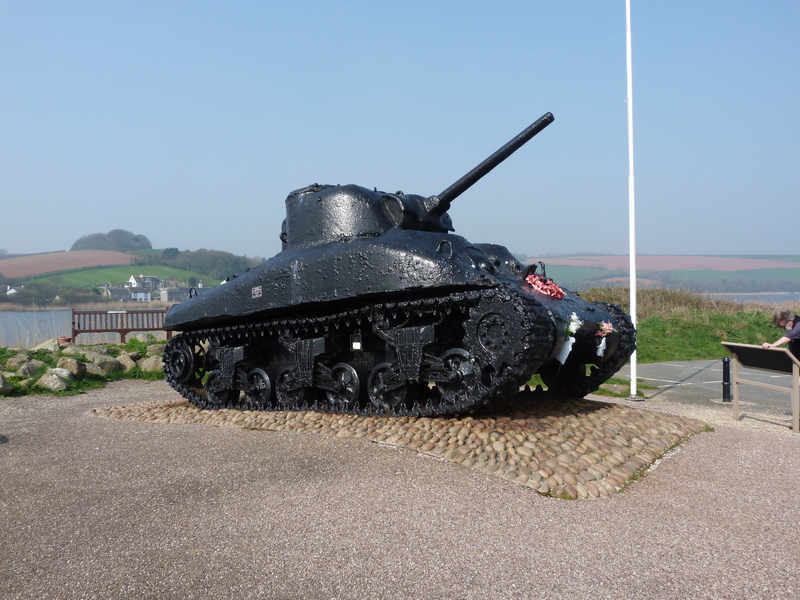 The tank and memorial sit just beside Slapton Ley. 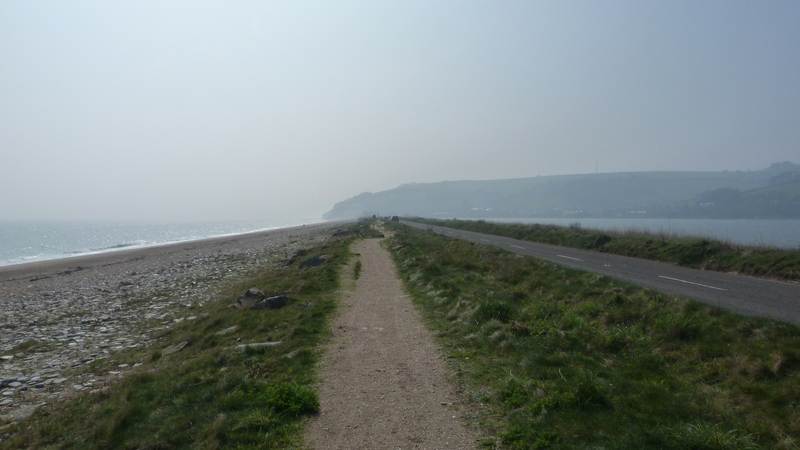 On the day that we were on Slapton Sands, there was a light Devon mist and peace in the air. 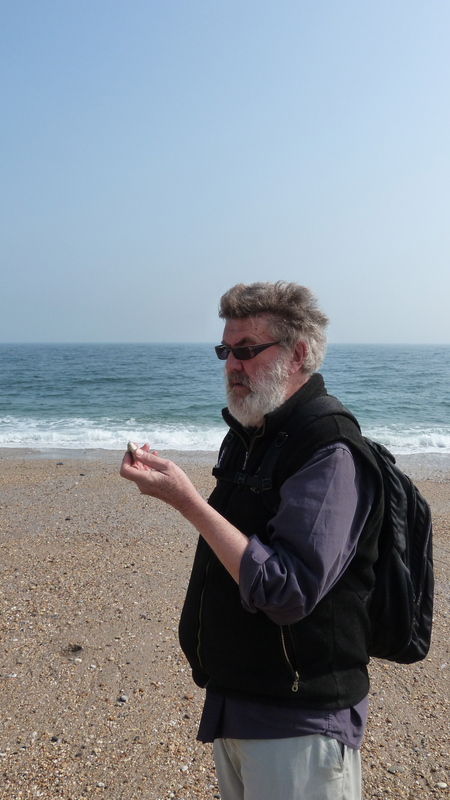 The beach is filled with beautifully polished rocks, which made walking a bit more work than usual but allowed us to find some of the most exquisite rocks we have seen on our journey. By the time we rendezvoused for lunch, our pockets were weighing us down with rock ballast. 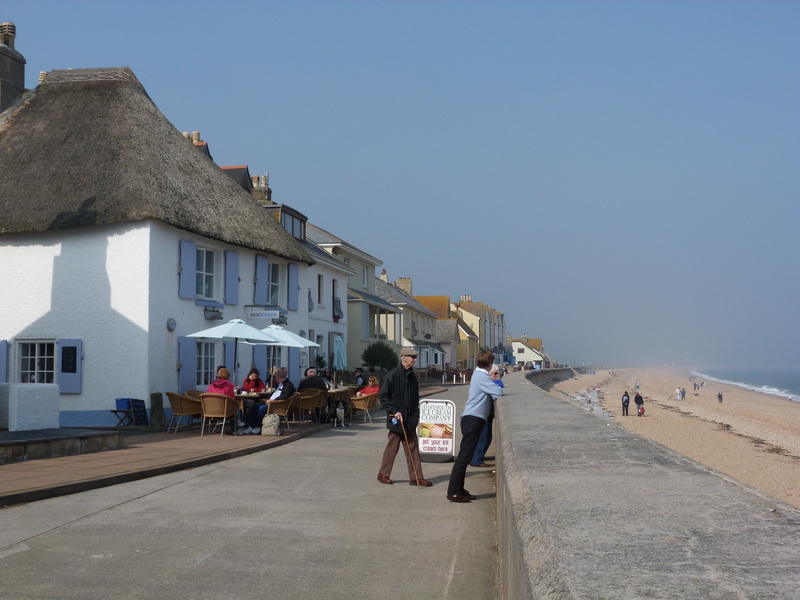 The tourist area of Torcross is right on the beach. There are a few cottages, a post office and a couple of places to eat. It was surprisingly uncluttered and free of tourist marketing, although there was a hefty line up for Salcombe dairy ice cream cones. 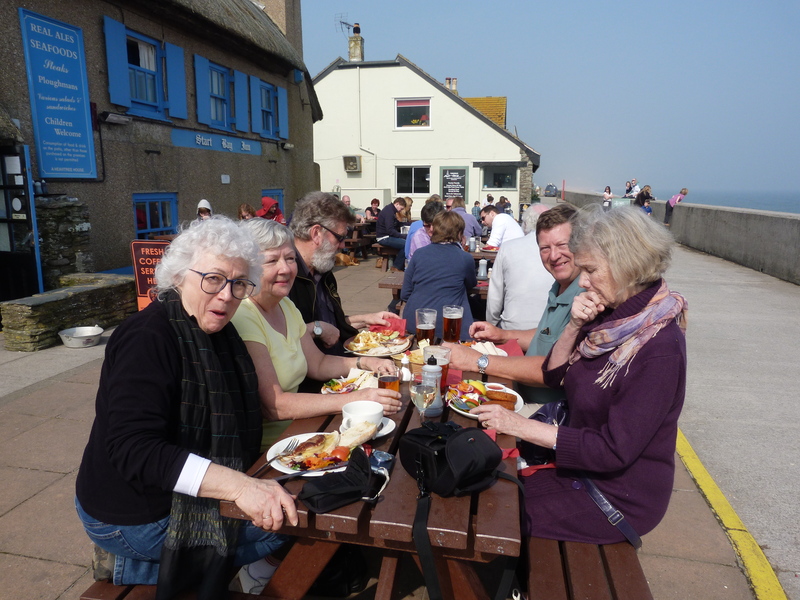 Local fish is the specialty of the Start Bay Inn, and we sat outside with full plates of crab, monkfish, plaice and cod. There were also sandwiches of exquisite local ham and cheese. And most importantly some very good local ales. Lunch inspired a further walk. Tim and I headed up over the hill to the next bay and the village of Beesands. Beesands sits on a long shingle beach and has a small collection of cottages and, by the look of it, some good places to eat. 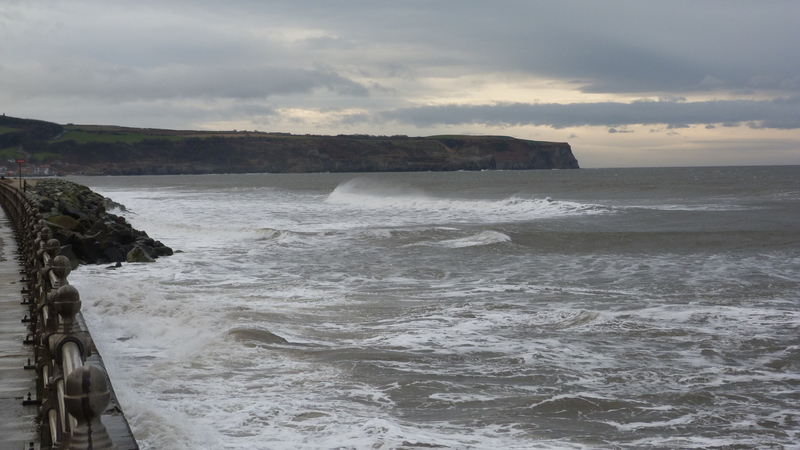 Beesands was a prominent fishing village in its day, but in 1979 it was almost wiped out by a violent storm. A large retaining wall was constructed in the late 1980s, separating the cottages from the view of the ocean. The wall clearly saves and protects the tiny village, but detracts from the beauty of the environment. It was time to head back to catch our bus. 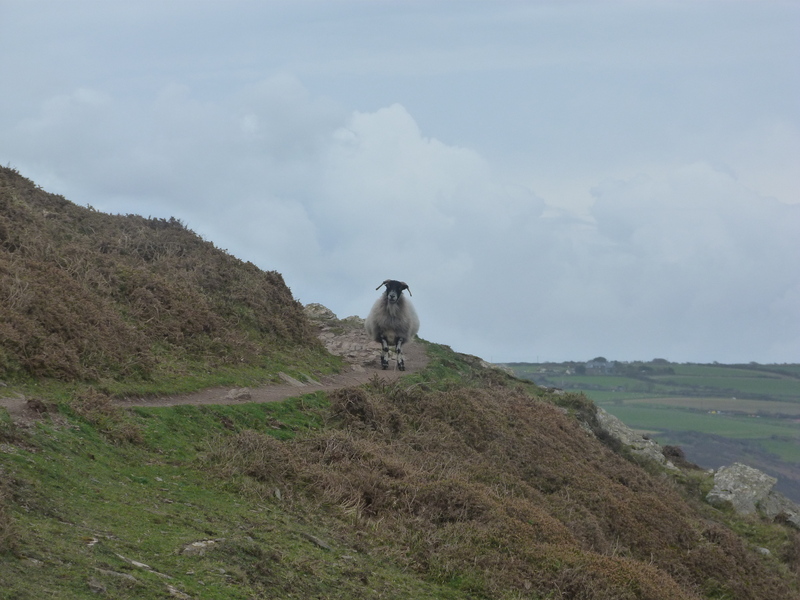 We didn’t have enough time to travel any further on the coastal path. 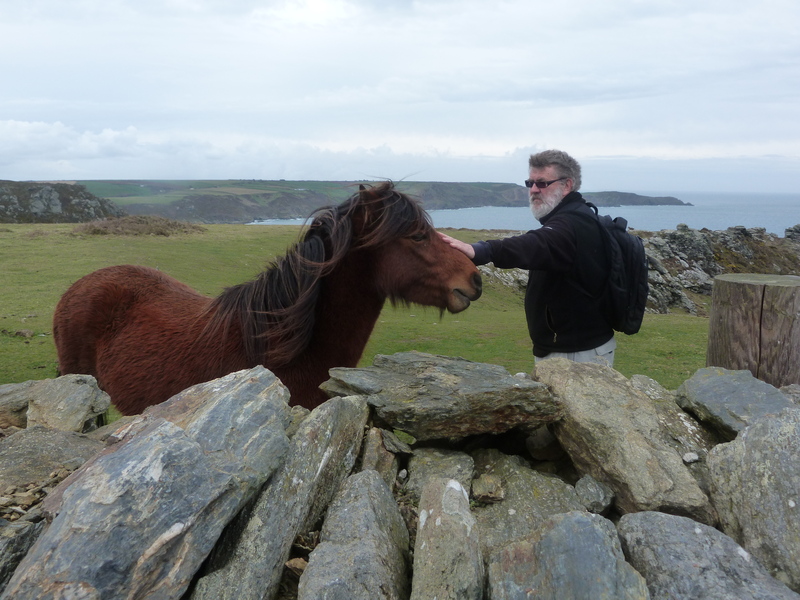 We had wanted to push on to the deserted village Hallsands, a village that was completely wiped out by a storm in 1917. Next time. There are stories around ever corner. But there is never enough time to get to all of the corners. And so we managed to rotate the cooking and planning. It all seemed to be based on our own private work schedule. Writing might be going really well, and you might not want to break your rhythm. Magically, someone else is cooking. Or perhaps you find you need a break, need distraction, need time to think while chopping vegetables. Everyone else is happy to give you space and time in the kitchen. Aside from the grocer’s, there is one butcher in Salcombe. It is a beautiful store, filled with local Devon pork, lamb, chicken and beef. The meat is exquisite, and the butcher is knowledgeable and helpful, supplying great cooking ideas. He also carries some of the finest Devon cheeses I have ever tasted. Down the road is a beautiful bakery. The breads and buns are lovely and fluffy and fresh. The bakery also makes perfect little squares called Flap Jacks that we sometime indulge in for our afternoon tea. And next store to the bakery is a wine and liquor merchant where we can find wines from all over the world, in various price brackets. All of these wonders are on the main street, two blocks from our cottage. We look for excuses to go down to the shops. Entertaining company is a great excuse for shopping and cooking. And this week, we’ve had some very entertaining company to cook for. 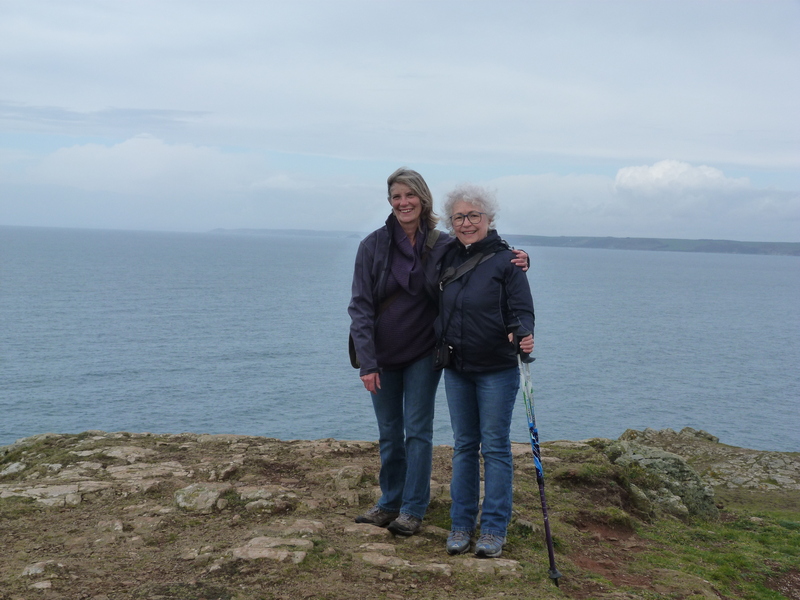 Jan has a couple of friends in Canada who, on hearing she was going to be in Salcombe said “Oh, you must meet Denise Coffey.” Denise is a former actor and director, who spent time working in Canada. She is quite a legend in the UK, having acted in such classic films as “Waltz of the Toreadors” and “Georgie Girl”. 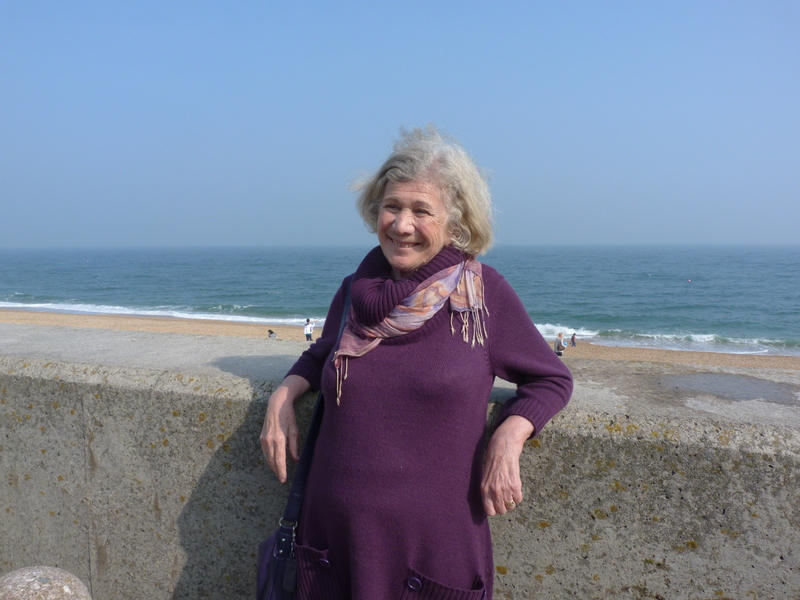 In fact she discovered Salcombe when she was in Devon filming “Far From the Madding Crowd”. She has lived here for over 30 years and now spends most of her time painting and rescuing damaged seagulls and cats. Denise, who now goes by the name of Moll, is a vegetarian and we’ve wanted to have her over for dinner. We had gone to see the new movie “The Most Exotic Marigold Hotel” and that put us in mind of Indian cooking. “Indian Ratatouille” requires a good supply of spices and patience to chop lots of veggies. But it is worth finding the ingredients. It’s a fabulous recipe. We’ve learned from previous experience to bring spices with us when we travel. Otherwise we are buying new boxes and jars in every place we stay. Also, you can’t always expect to find Panch Phoran in your neighbourhood store, no matter how wonderful it is. You can’t always count on a neighbourhood Bay Laurel. So we came prepared, travelling with some of the more exotic spices. Thank goodness we had packed our Panch Phoran. Moll was, I think, very impressed. 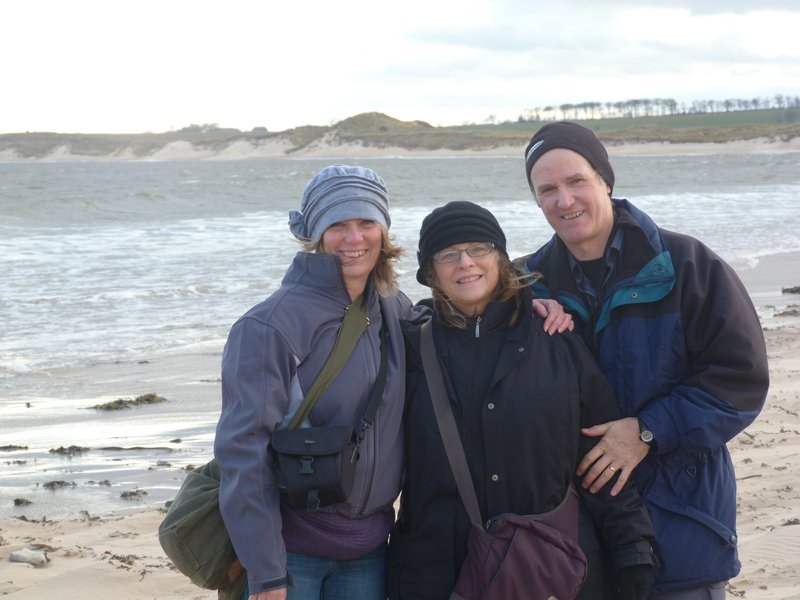 The other visitors that we had this week were Mal Peet and Elspeth Graham, the wonderful writer friends who we met last fall in Exmouth. 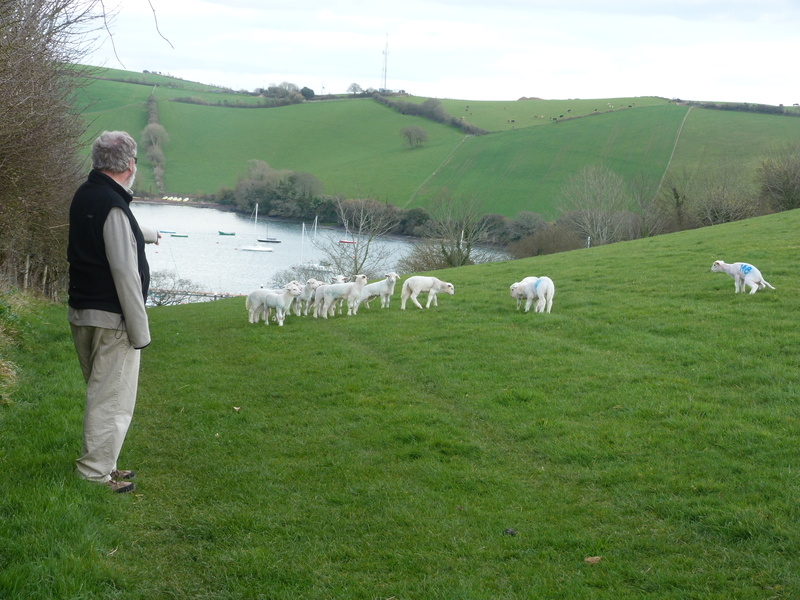 It was really exciting to see them again and to take them on one of our favourite local walks to Snapes Point, through gently wooded areas and fields of gamboling lambs. 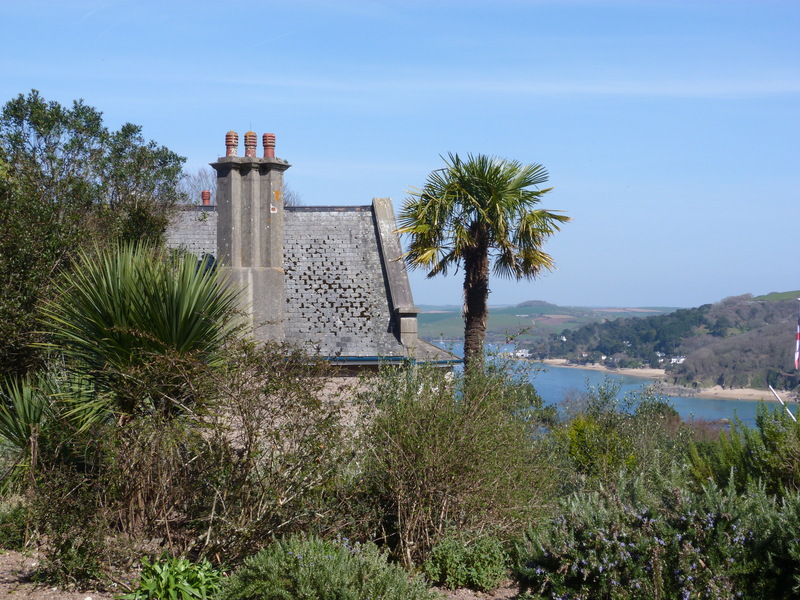 The point overlooks one of the arms of the Salcombe Estuary and the millionaire’s cottages across the harbour. The church bells can still be heard chiming in the distance. 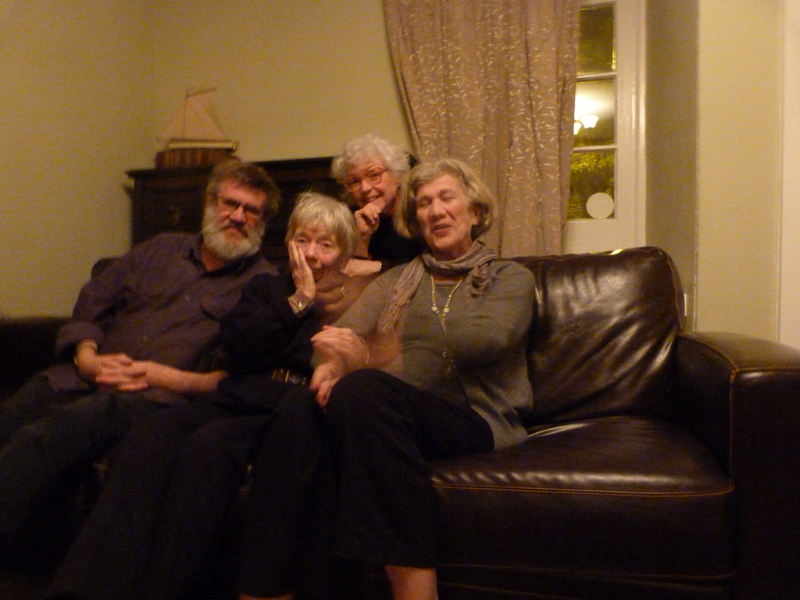 Jan, Jennifer, Tim and I all had a hand in putting together the dinner for Mal and Elspeth. The new tastes for us were Jan and Jennifer’s contributions. Jan made her fabulous Umeboshi salad. Umeboshi is a dried, pickled plum from Japan. Ume vinegar is salty and sour and Jan uses it in a Kale salad that we are all crazy for. Jennifer made a delicious Pear and Ginger Crumble and served it with Salcombe Dairy ice cream. It was a fabulous night of eating, drinking, and sitting by the fire to talk about books, art and, of all things, the Canadian constitution. We have been thrilled to discover the tastes and sounds, smells and sights of Devon, as well as to share some of our own favourite recipes with new friends. On a recent Saturday walk we decided that we had sufficiently built up our thigh muscles to face a tougher walk. 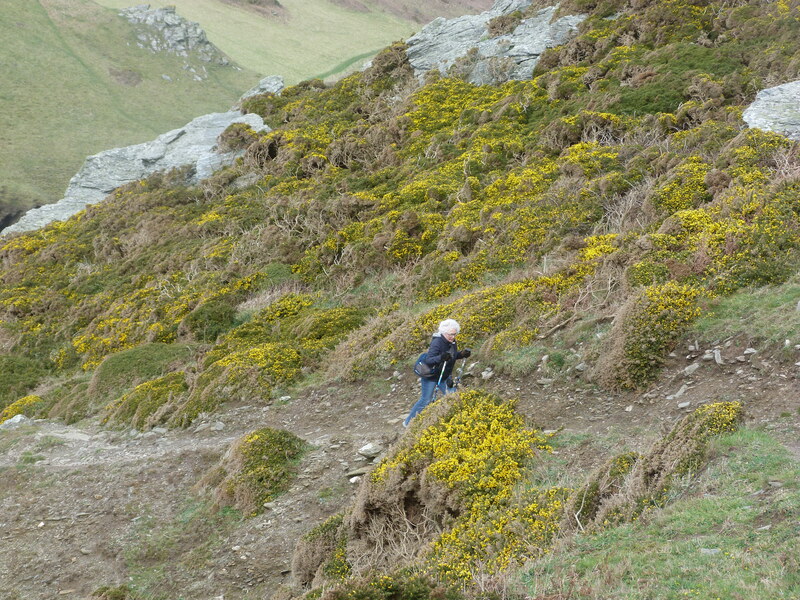 The Hope Cove to Salcombe walk is on the south west side of the peninsula and we were told it had some rugged paths, with some degree of difficulty. The gauntlet was thrown. There are very few busses in or out of Salcombe, so we had to coordinate our time carefully, taking a bus to the tiny nearby town of Malborough and then transferring to a bus to take us to Hope Cove. 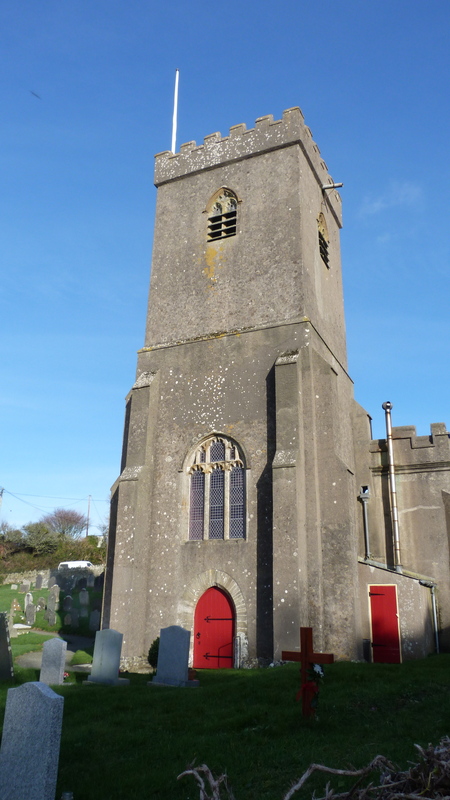 At the heart of Malborough is the parish church, founded around 1200 AD. With its 13thcentury stone vaulted roof and a perfectly preserved pointed spire sitting atop a hill, it can been seen throughout the countryside. We waited outside the post office beside the church for our bus. Tim waiting outside the Post Office for the bus. 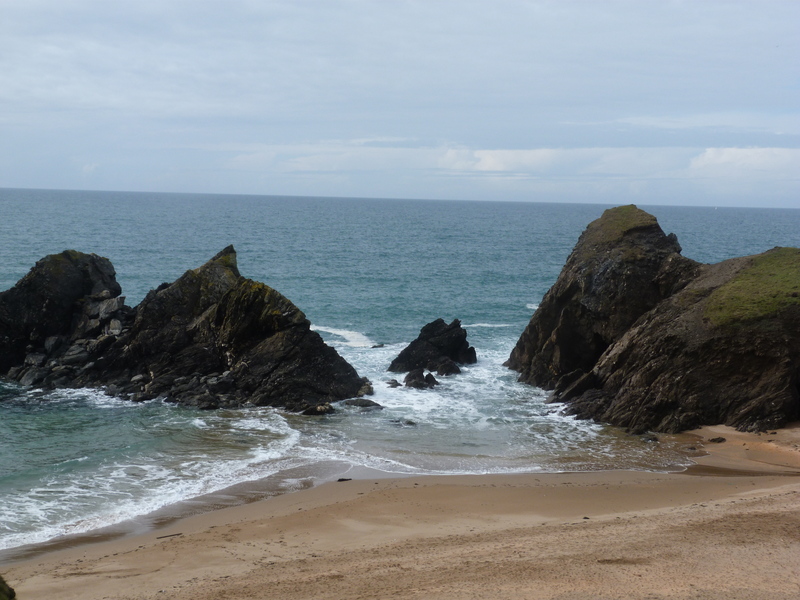 Hope Cove sits nestled between Inner Hope and Outer Hope. (I am not making these names up. We had quite a debate as to where one would rather live – in Inner Hope or in Outer Hope.) 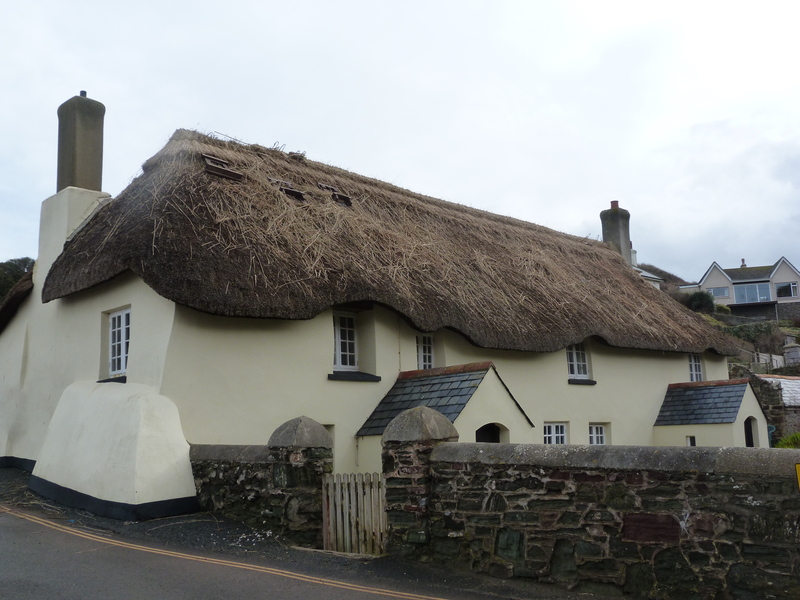 Hope Cove was a favourite among smuggles, and the tiny cob cottages with thatched roofs made us feel we were in the midst of a novel. 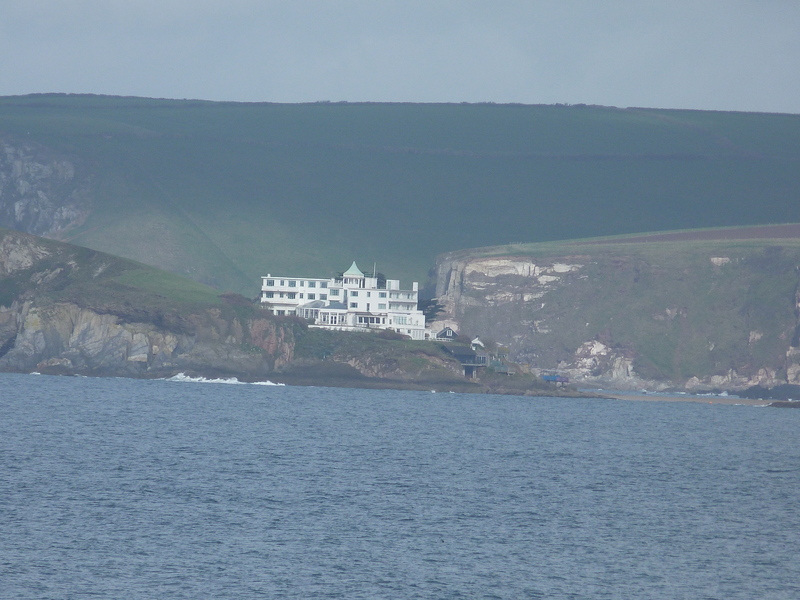 Just off the cove is Burgh Island where there is a complete Art Deco hotel. The site is associated with Agatha Christie’s book “And Then There Were None” as well as the Hercule Poirot mystery “Evil Under the Sun” and many celebrities have stayed in the hotel over the years. We could only view it through a telephoto lens, unfortunately. The Art Deco Burgh Island Hotel, "The Great White Palace"
We made our way out of Inner Hope and headed up toward the cliff, only to discover a group of 25 hikers, most a bit older than us, on the path. We raced ahead, knowing that it would be best to be in front, rather than behind the pack. They were stopping from time to time for guided information, but they were keeping a fair clip. The nation of walkers was showing us some of their best. We burned our thighs up toward Wolf Rock and Bolt Tail, high above the water, crossing an Iron Age Fort embankment. We passed by lines of pre-historic standing stones, stretching out into the distance. The path took us through Bolberry Down, a beautiful grazed area filled with sheep and new spring lambs. In 1760 a Spanish ship went down off the coast of Bolberry Down, killing 700 men. Another wreck. More lost hopes. We made a pit stop at the one habitation on our route, Port Light, which is a small collection of buildings formerly a part of RAF Hope Cove. Asking about the road ahead, we were told that it was rough in places, that we had a section coming up with a lot of highs and lows but that after that things got flat. “Should take you about 3 hours,” the proprietor of the Port Light restaurant told us, eying our greying hair. “I do it in about 2 ½”. After a few bites of apple and lovely Devon cheese, we set out with will and determination. 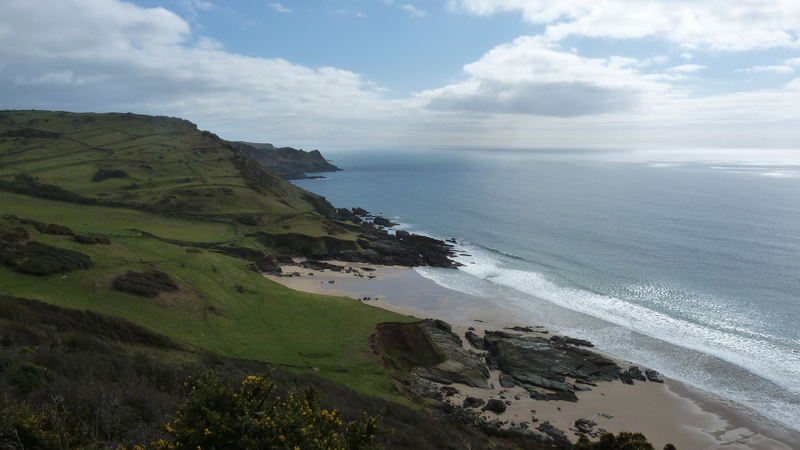 From the high cliffs, the path led us down to the tiny beach at Soar Mill. Isolated and perfectly proportioned, it is a place to come back and spend a day lazing. The path led us up again. 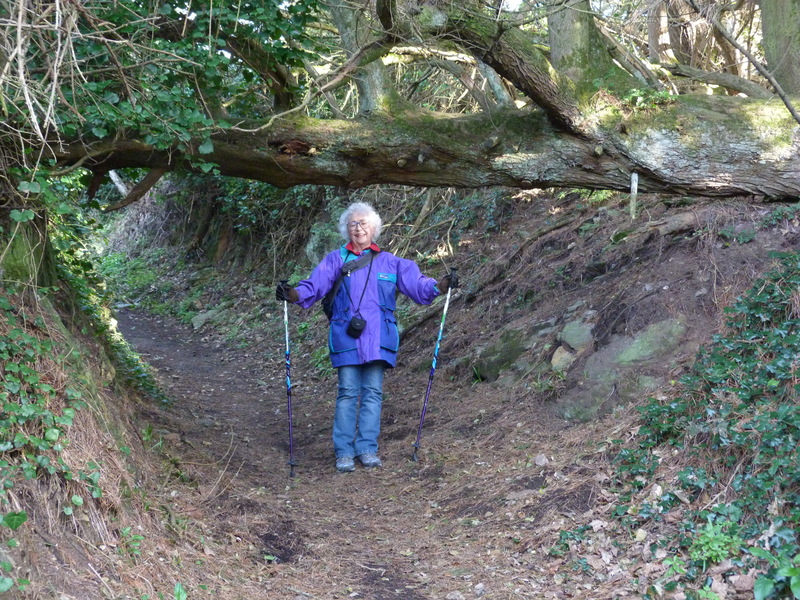 The way was very steep and Jan was glad of her walking poles. 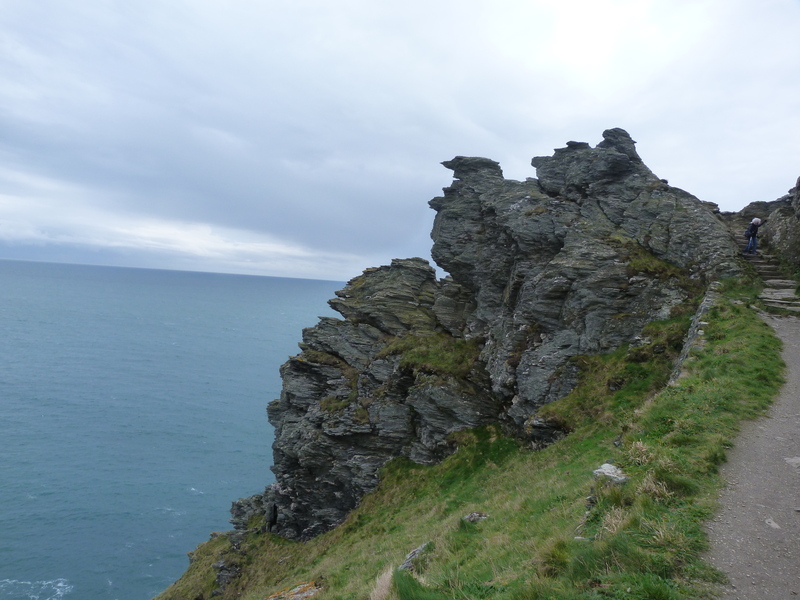 We huffed and puffed our way up to Bolt Head, the most southerly point of Devon. I clamboured out as far as I could go, well beyond Jan and Tim’s comfort level. I managed to take a picture of myself, on the edge. The rocks were right behind my head. There was nothing between me and the ocean far below. I turned around to realize that I was alone and mildly terrified of going back down. I slide down gingerly on my backside. We rounded the corner, dodging sheep, to look down on the green blue waters of Starehole Bay and the dramatic rocks of Sharp Tor. These are “metamorphic rocks”, rocks that have changed their nature through pressure or heat. They are incredibly dramatic formations that look like they have been squeezed out of the earth and are ready to fall on unsuspecting hikers below. 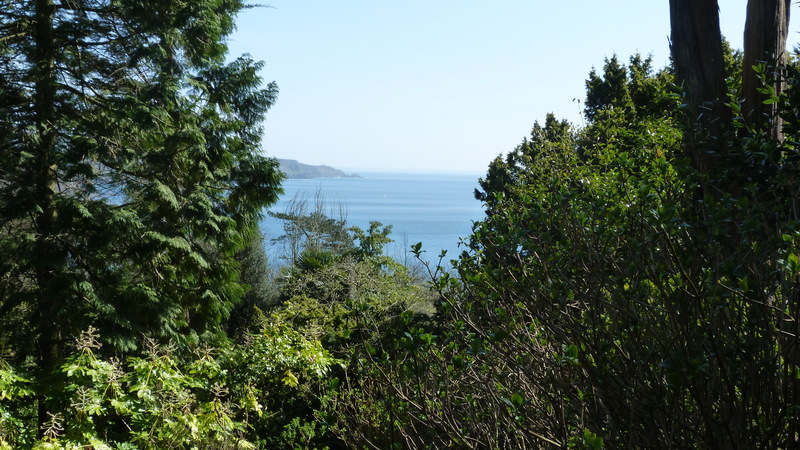 We continued on toward Salcombe, past the small luxury hotels in South Sands, the enthusiastic dog beach at North Sands, past the million pound homes and cottages along the coast. It had been a good 9 mile walk, and yes, took us about 3 hours to complete from Port Light. We ended the adventure with a bowl of crab bisque and a pint, in front of the fire at our favourite Salcombe pub, The Victoria Inn. The perfect place to massage weary feet. This is a nation of walkers. And the coastal paths of the National Trust are wonderful. They are varied, well marked and well used. Apparently between 50 – 100 million people visit the National Trust coast and countryside properties each year. The coastal paths circumnavigate the country, inspiring people of all capacities to get out and marvel at the beauty of “this scepter’d isle, This earth of majesty”. We’ve been going on walks every day. There are a number of good 4 – 5 mile hikes that we can take right from our doorstep. On Saturdays, we try to choose longer paths of 5 – 10 miles. 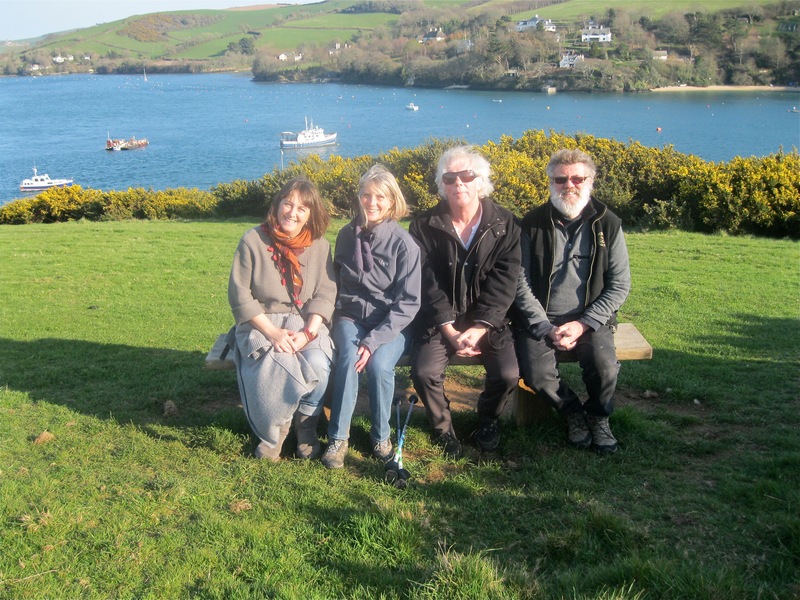 The Salcombe to Gara Rock hike began with a ferry ride across the harbor to the East Portlemouth side of the estuary. A paved road led us to the sandy beach of Mill Bay, a perfect, fine sand beach with a few bouncing dogs and children out enjoying the spring weather. The path then began its ascent, taking us past Biddlehead Point, Sunny Cove and the Hipples until the headland turned and we faced the full force of the Atlantic. Historically, vigorous sea trade moved through these waters. For centuries, the mariner’s existence both contrasted and complimented the tranquil rural existence of the farmers. Unlike other rocky shores, the soil here is rich and arable. On the headland opposite, Deckler’s Cliff, we could see Bronze age field systems, clearly visible as earthworks under the soil. It is humbling to think that this land has been under cultivation for thousands of years, and it still retains its rural roots. The Atlantic meets the green hills of Devon. If you look closely, you can see the lines of earthworks under the soil. 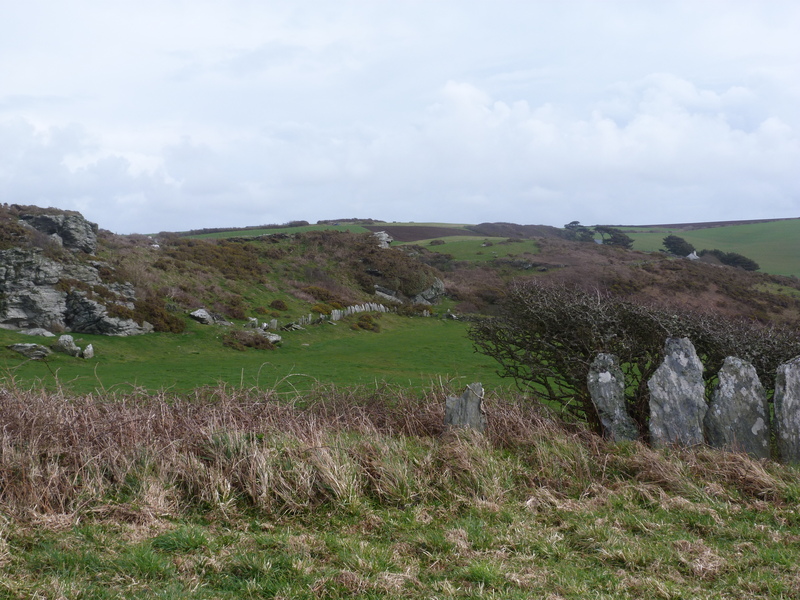 Just beyond Gara Rock is Moor Sand, where, in 1977, a cache of Bronze Age weapons was found. Archeologists believe that a ship want down here about 3,000 years ago. There has only ever been one other pre-historic wreck found in England. The waters off these shores are treacherous. 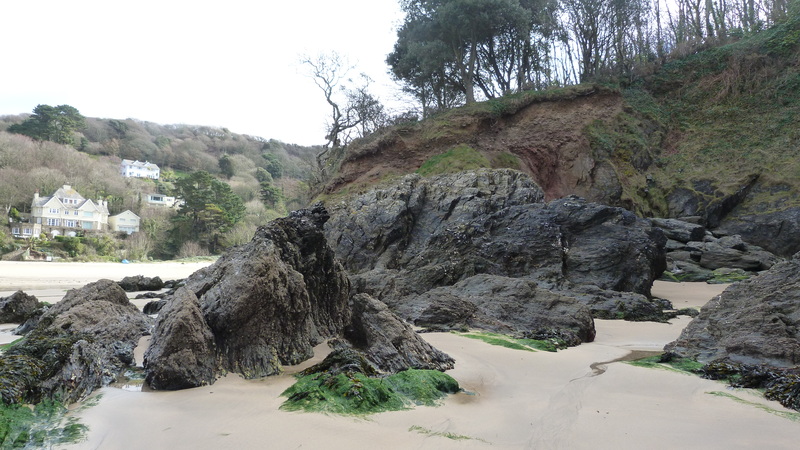 The Salcombe Canon wreck, also in this area, found coins and jewels from the 16th and 17th centuries, helping archeologists trace trade between England and Morocco. They think there is probably still a lot more to be found. From Gara Rock we went down to the beach at Seacombe Sand, a perfect place for our packed picnic of delicious Salcombe Crab sandwiches. 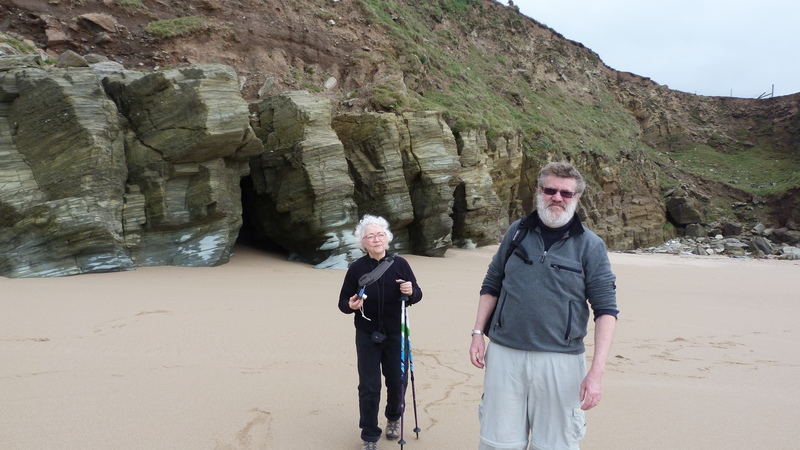 Tim and Jan on Seacombe sand, looking for a perfect place to picnic. But we didn’t dawdle, as it looked like a storm might be blowing up. We headed back through deep green leafy woods, a less steep, less dramatic path but one that offered an entirely different flora. 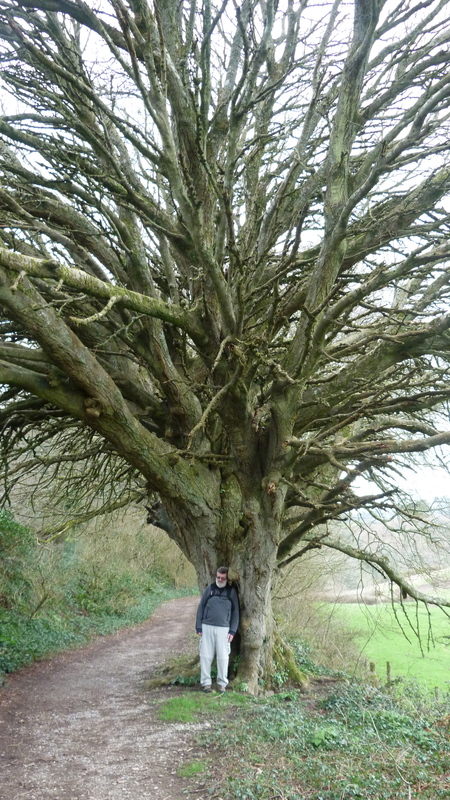 Huge trees on the inland path. Quite a contrast to the coastal path. The path spilled us back at Mill Bay. The rain held off. I curled up with a rock for a back rest, Tim paddled about in barefeet at the water’s edge and Jan searched for perfect shells. The perfect end to a dramatic day. The Rocks of Mill Bay. As I write this, I am looking out over a quiet estuary, dotted with small fishing boats and sail boats. The lush green hills on the opposite shore slope down to meet the water’s edge. Gulls are swooping and calling as the tide comes in. 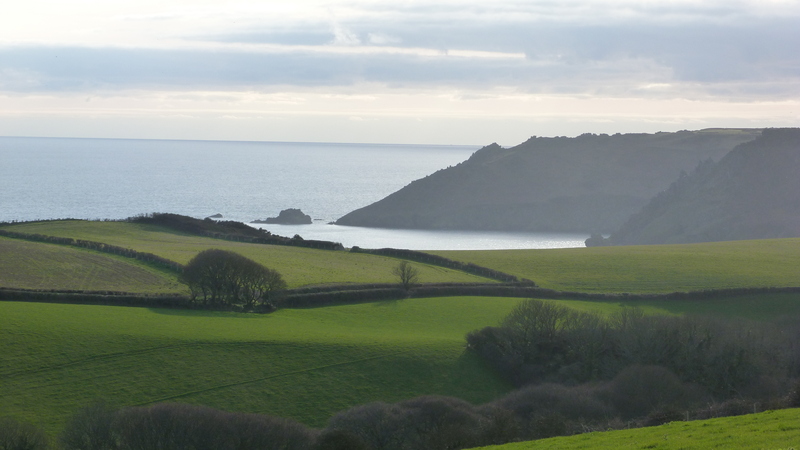 We’ve come to Salcombe, in Devon, for a month of writing and walking. We’ve rented a house, inviting our friend Janet and Tim’s sister Jennifer to share in our retreat. We have each staked our claim to a work area, and spend days working on different projects. But we make sure to take time for long rambles in the Devon countryside, challenging our thigh muscles on the hills. 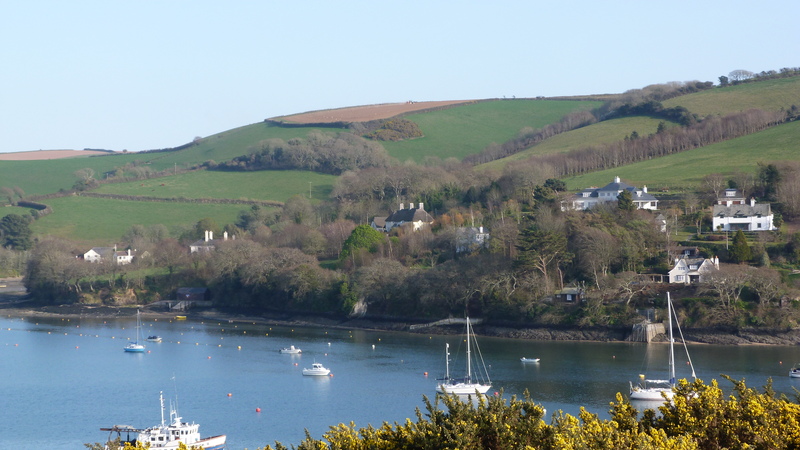 The Salcombe and Kingsbridge Estuary is in the South Devon “Area of Outstanding Natural Beauty”. It is also a “Site of Specific Scientific Interest”. The estuary is not, strictly speaking an estuary. It is a “ria”, a drowned river valley that is fed by the sea rather than by a large river. It is tidal all of the way up to Kingsbridge, 5 miles inland. As the tides go in and out, they leave long mud flats, shallow along the shoreline at low tide. These flats provide rare and important habitats to a host of marine species. It is a paradise for wading birds and otters, crabs, clams, seahorses and mussels. 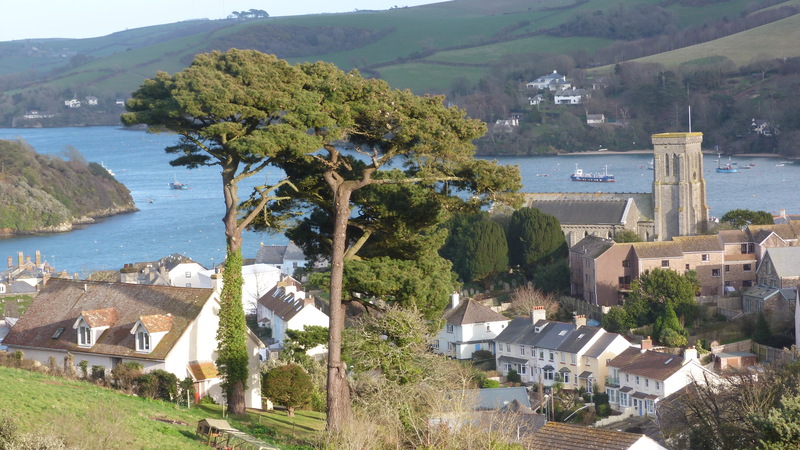 Salcombe has been known for shipbuilding, smuggling and crab fishing. The estuary is treacherous with sandbars and jutting rocks that have caused a number of spectacular shipwrecks over the centuries. Recently they discovered a Bronze Age sea wreck off the coast. Henry VIII built a castle here to defend the estuary again the French and Spanish pirates. Historically the town’s claim to fame is as the last stronghold of the Royalist forces during the English civil war. 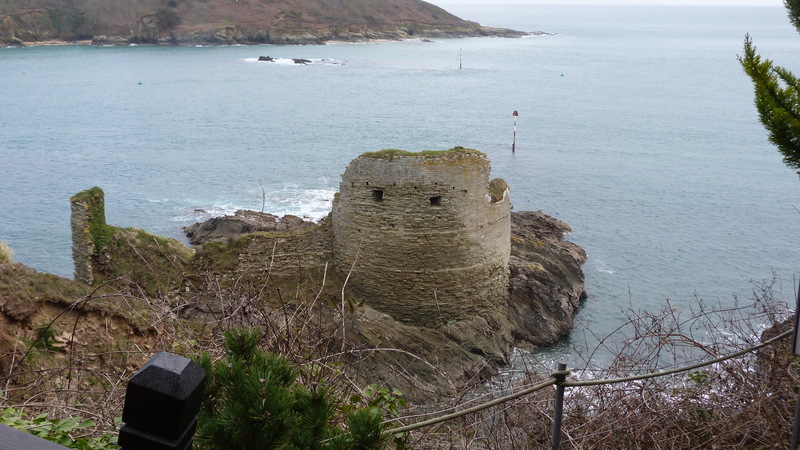 During the civil war, Sir Edward Fortesque held the castle, called Fort Charles, defending the Royalist town of Salcombe until it was clear that the rest of the country had conceded to Oliver Cromwell. Parliament ordered the castle destroyed, siting that it was “too dangerous” to leave it standing. In the days of sailing vessels, Salcombe was an important shipping port, with the specially designed Salcombe Schooners sailing to Iberia, the Mediterranean, the Caribbean, the Azores and Newfoundland. They returned with exotic fruits, sugar, coconut, rum and wood for ship building. But with the advent of steam ships, shipping moved to deeper waters elsewhere along the coast. 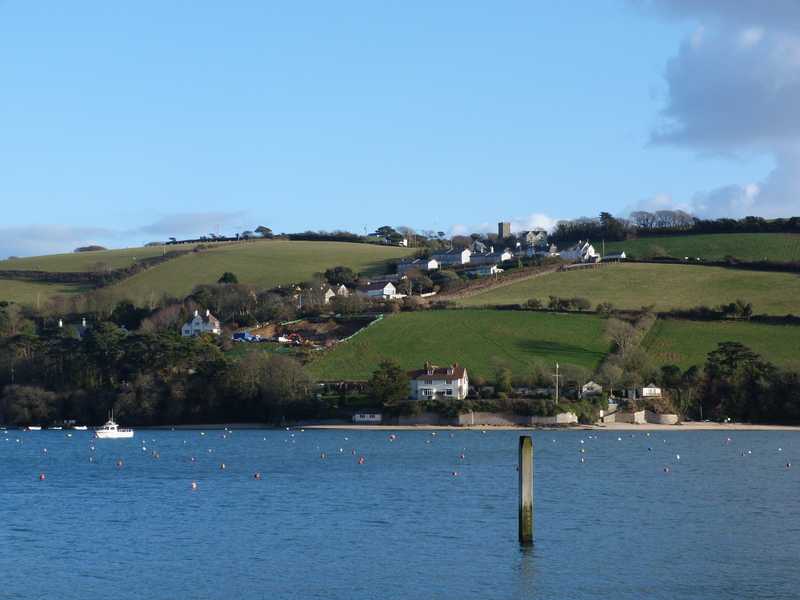 During the Second World War, Salcombe became an “Advance Amphibian Base” for the US Navy. On June 4, 1944, 66 ships sailed from Salcombe to the DD invasion at Normandy. There is a plaque dedicated to the American men who lost their lives in that battle, and one of the docks has been named the Normandy Dock. 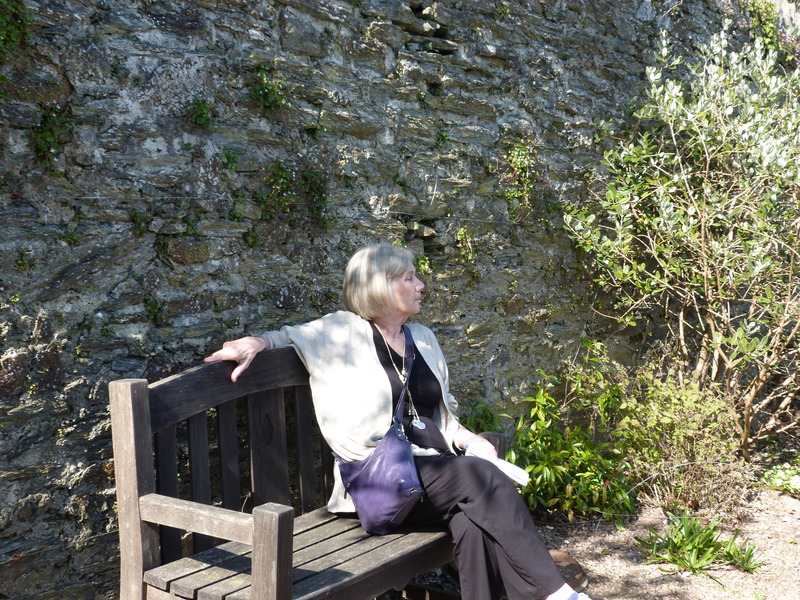 Even in little Salcombe, the impact of war is a fact of life. Now, however, the town is primarily known as a place for pleasure boating and holiday-making. The houses and cottages in the old part of town are immaculately kept. The steep hills hold the village in, encouraging it to remain tiny and perfect. The main street is about 5 blocks long. The population is around 2,000, although our landlord says that increases 100 fold in the summer. Interestingly, the real estate prices are the second highest in England outside of London. The “townies” who were born here, or who have family property, would never be able to afford the prices that the people from away are willing to pay for this piece of paradise. But we are here in the off-season. The village is just beginning to gear up for its busy summer. Some shops will remain closed until Easter, and the few that are open are painting trim and washing windows. We get to mix and mingle with the folks who actually live here. 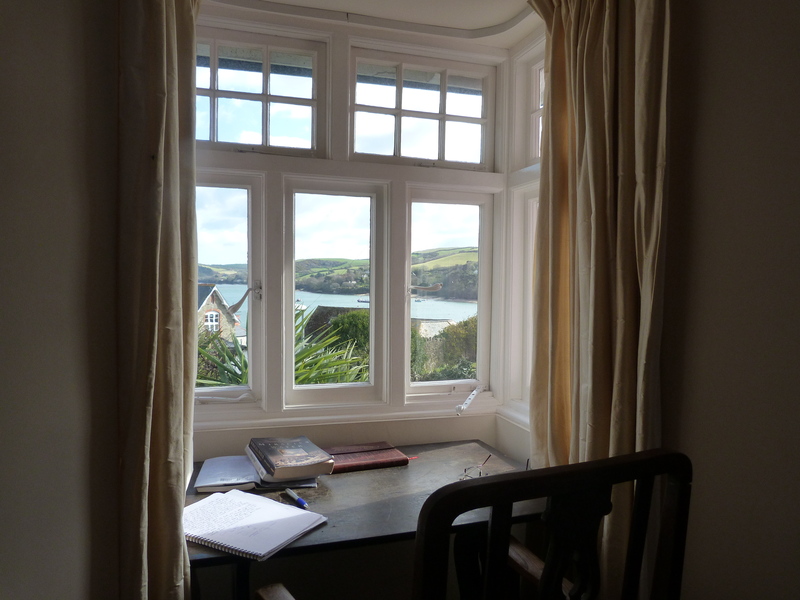 From my writing window, I can see the tiny village of East Portlemouth across the harbour. We decide to make it our first “major” outing from Salcombe. 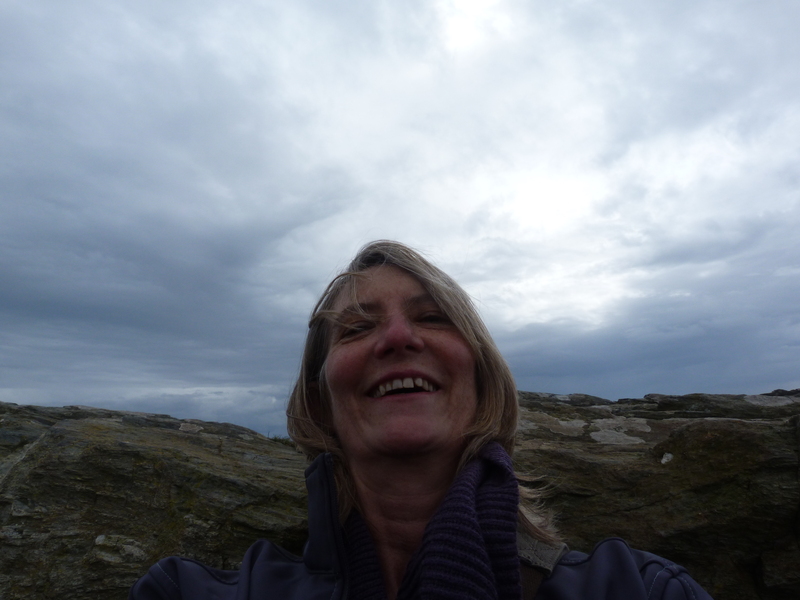 For £1.50 each, Jan and I took a ferry across, to see things from the other side. The ferry takes less than 5 minutes, and is simply an open boat with seats for about 10. There are other ferries in the high season connecting to other places on the estuary, but at this time of year there is just the one and it runs across every half hour. East Portlemouth used to be a thriving port in the 14th century, but in the 19th century the Duke and Duchess of Cleveland, who owned all of the land, dispossessed the tenant farmers to amalgamate all of their lands. All of the cottages were destroyed. Today, there are probably on 20 people who live in East Portlemouth. That’s just a guess. It is known for its extreme beauty and isolation, and for having a few very wealthy second home-owners sparking an interesting political struggle. 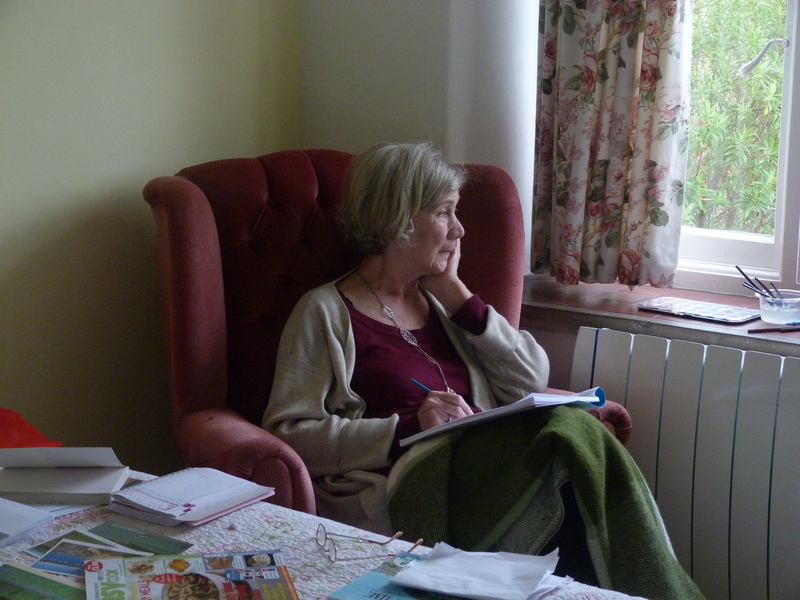 A local landowner who has lived in East Portlemouth all of her life wants to build some cottage homes for low-income families. She feels that it will keep the village alive if there are ordinary people can still afford to live there. However, the millionaire second home-owners are not in favour. A large excavation is taking place. I am not sure who is winning the battle. We walked up to the ancient church on the hill, the church of St. Winwaloe. The church was built in the 12th century on the site of a 10th century church, under the reign of King Athelstan. King Athelstan (the great grandson of King Alfred) had come from Brittany, the birthplace of the Celt St. Winwaloe (462-532 AD). After St. Winwaloe’s death, monks travelled throughout Devon and Cornwall founding monasteries and churches. St. Winwaloe’s was locked on the day that we were there, but we were treated to ravens calling from the tower. The church graveyard includes 17th and 18th century tombstones of sailors and smugglers. From the church we had a choice of several footpaths and decided that we’d head along the high path, so that we could take in a larger view. 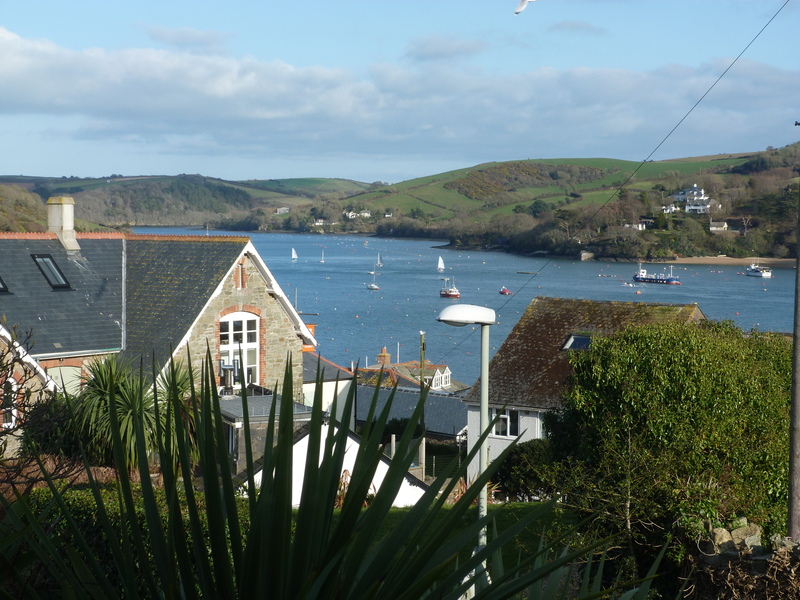 Salcombe is nestled into the hills, down by the water’s edge, and it has been hard to figure out exactly what the coast looks like. And this way, we can enjoy the million-pound view for free. We walked along the top of the hill toward High House Farm and the ocean opened out in front of us. An area of outstanding beauty. Indeed. Thank goodness we have a month to explore. The walks are just beginning. In mid February, you can feel a bit blue no matter where you are. So when our friends Geoff and Carolee said that they were coming to visit from Canada, it was just the lift we needed. Together we planned a quick trip to the north east coast of England, in search of perfect places. Years ago, Carolee and Geoff had been to Whitby. 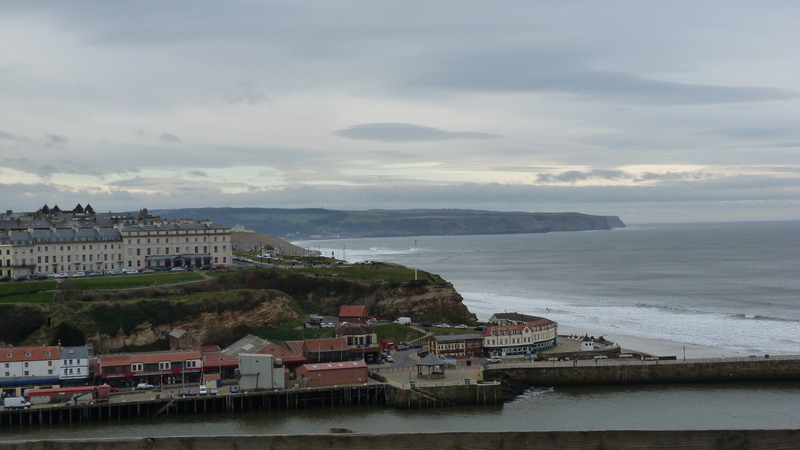 They had loved it and wanted to go back so we took a train from London to Leeds, picked up a rental car and headed out to coast of North Yorkshire. 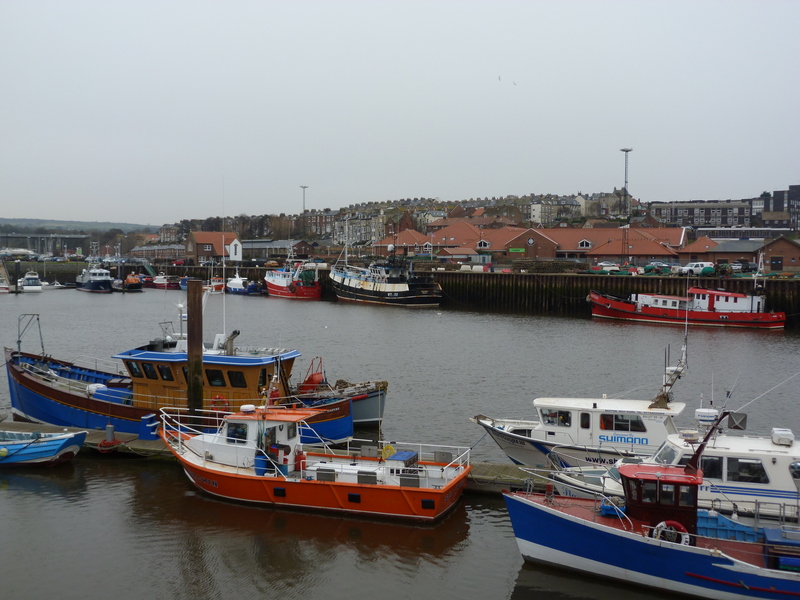 Whitby is a quiet fishing village surrounded by the North York Moors. It is remote and isolated by the moors so it never became a major trading centre. However, its natural geography, a wide estuary between two cliffs, made it a valuable port. 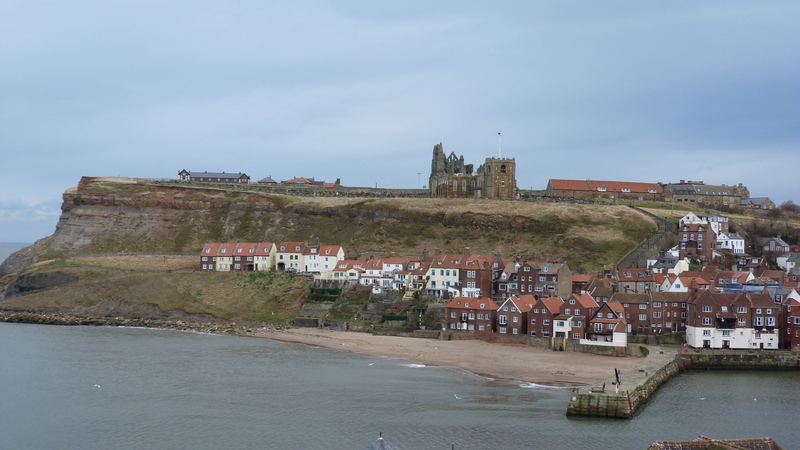 By the end of the 18th century Whitby was renowned for shipbuilding and whaling. Captain Cook and William Scoresby (an Arctic navigator who began on the whaling ships) both learned their sailing skills here. Whaling in particular brought money into the town, and the wealth eventually encouraged Whitby’s development as a spa tourist destination. The area is also a primary source of the mineral Jet, and the streets are lined with jewelers’ creations. 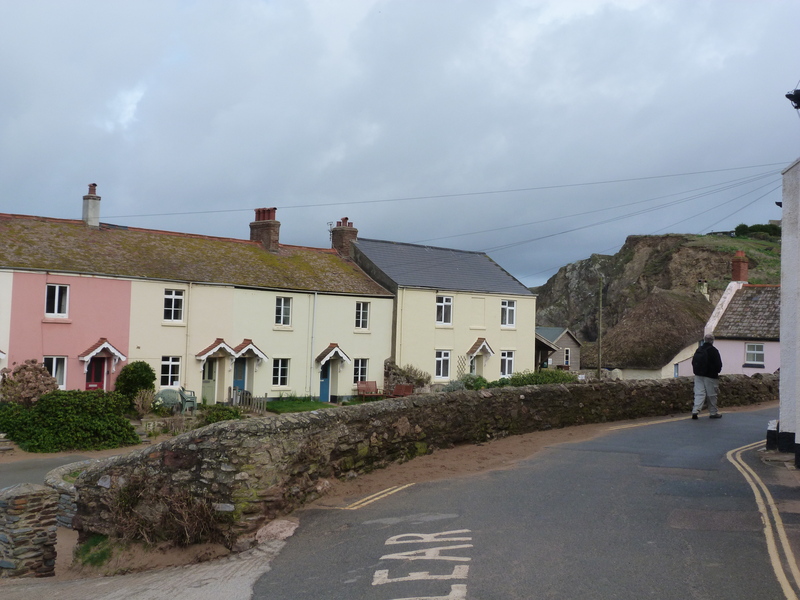 The village has lovely quiet cobbled streets, spectacular views, and a terrific selection of good restaurants. Even in the dreary days of February there were a fair number of tourists – it must be packed in the high season. High above the town sits the ghostly ruin of Whitby Abbey. 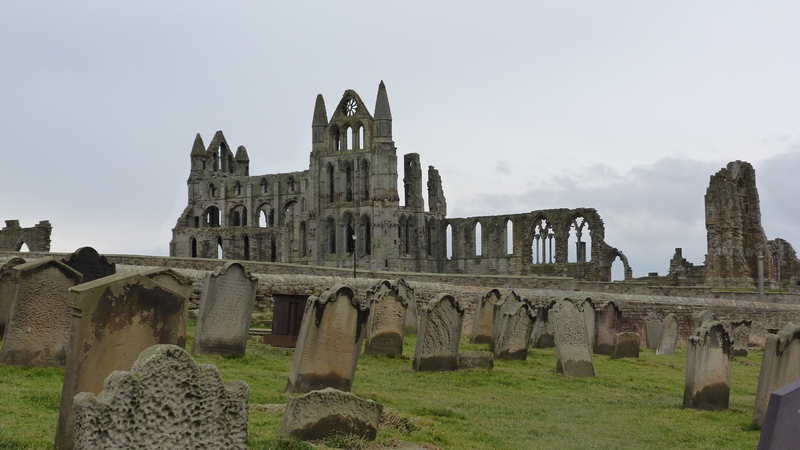 The first abbey was built in Whitby in 656. Called Streoneshalh (the old Norse name), it was a “double-monastery” for men and women and became a great centre of learning. It was here, in the 7th century, that Caedmon, first English poet whose name is actually known, wrote his poems in praise of God. This first abbey was ruined by the Danes and a second was built on the site in the 11th century. However, it was destroyed under the reign of Henry VIII and left to crumble and to suffer additional damage during the Second World War. The Whitby Abbey ruin has been an inspiration for people throughout the centuries. It formed part of the setting of Dracula, by Bram Stoker so it is a contemporary Goth pilgrimage. We didn’t don our black garb, but we did huddle in the cemetery, battling in fierce winds that threatened to blow us off the cliff. Most tourists would not chose the North Sea as a destination in February. 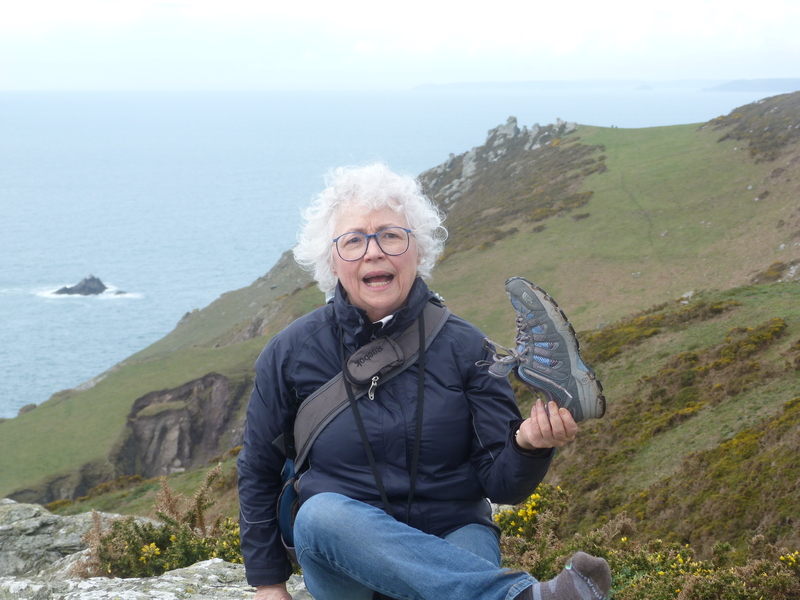 A walk along the coastal path was invigorating, exhilarating and damp, just the kind of thing to spark a good appetite for a pint of local ale and an order of fish and chips. Whitby also specializes in smoked kippers, which has got to be the best breakfast in the world if you are planning a journey out on the Moors. 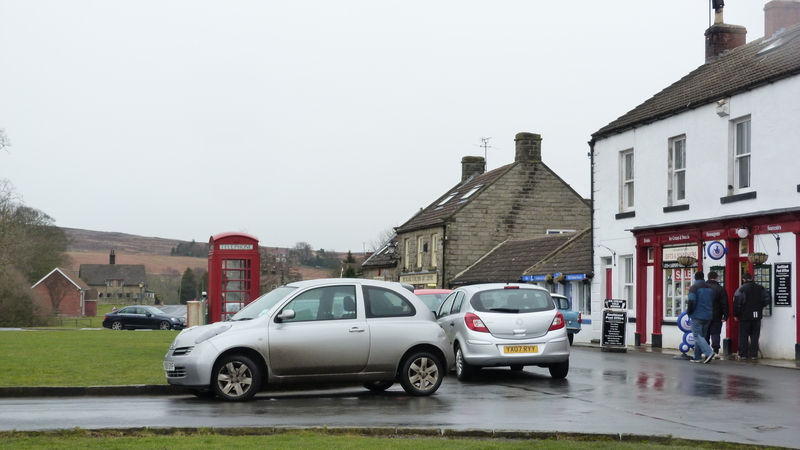 Just across the Moors from Whitby is the town of Goathland. Goathland (the “h” is slient) known all over the world as the fictional town of Aidensfield, the setting for the BBC series “Heartbeat”. Carolee has been researching her family tree for years and she had traced a distant cousin to Goathland, so off we went. Goathland is a tiny village of about 400 people. There are lovely stone paths and access points to footpaths on the Moors. The area is owned by the Duchy of Lancaster (basically, the Queen) and her Scottish Blackface sheep have a right to graze anywhere. There are no fences and the sheep roam everywhere, very much in ownership of the village. You have to watch carefully where you walk. 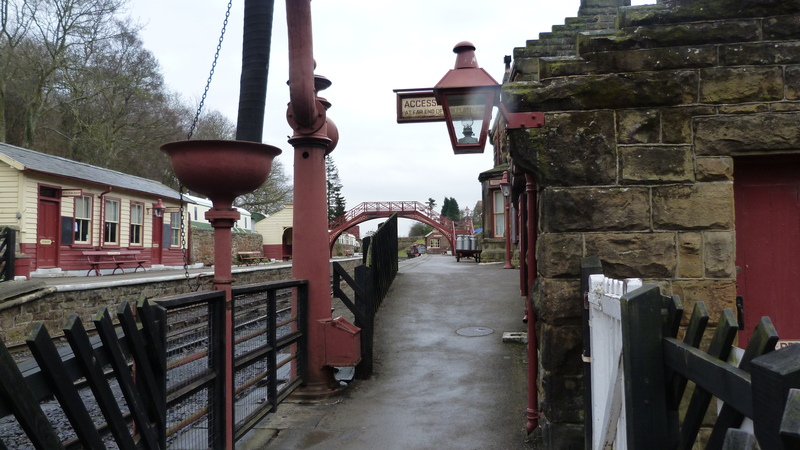 Little has changed in the 3 centuries since Carolee’s cousin Richard Middleton lived in Goathland, although he wouldn’t have seen the North Yorkshire Moors steam train station that was certainly a highlight of our visit. It is the station that was used in the Harry Potter movies for the Hogsmeade stop. With Dracula, Heartbeat and Harry Potter, I was beginning to wonder if the entire area was real or imagined. One of Tim’s preoccupations on this trip has been to try to find “the perfect seaside village”. So while in this part of England, we decided to take a day trip north to Alnmouth, which Tim thought he had seen from the window of a train many years ago. We wanted to find out if it was real, or imagined. To get to Alnmouth, you need to go through Alnwick, a medieval market town dating from 600 AD. In 2002 Alnwick (pronounced Annick) was voted by Country Life as “the most picturesque market town in Northumberland, and the best place to live in Britain.” It has thrived as an agricultural centre and its history is intimately linked to the castle that rises above it. 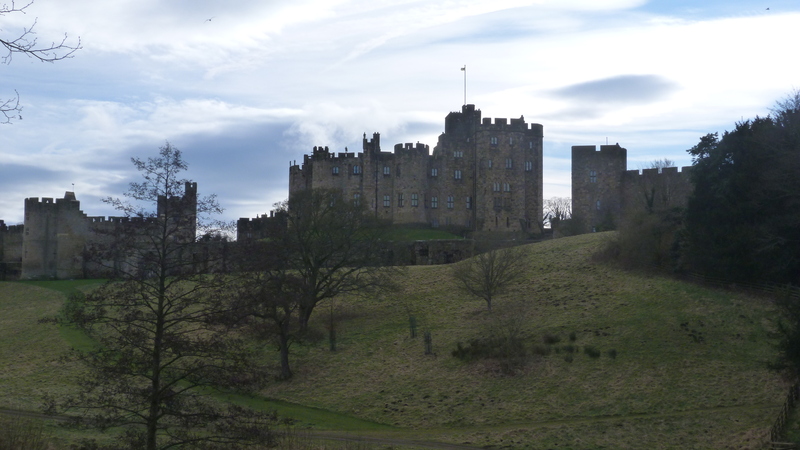 Alnwick castle is still privately owned. It has been in the possession of the Percy family since 1309, making it the oldest continuous family-owned castle in the UK, other than Windsor Castle. 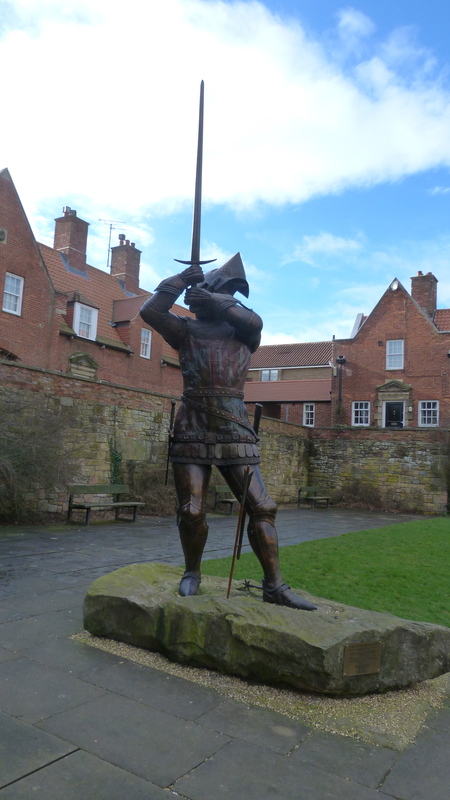 Perhaps the most famous Percy was Sir Henry, known as Harry Hotspur, who lived there from 1364-1403. The Castle is picture perfect. It, too, has been used as a film set (Harry Potter, Black Adder, Robin Hood: Prince of Thieves). The Percy family was at home, so we were not able to go in to visit. Instead, we walked through the town and found a surprisingly good place to eat a light tapas lunch before heading out to the seaside town of Alnmouth. 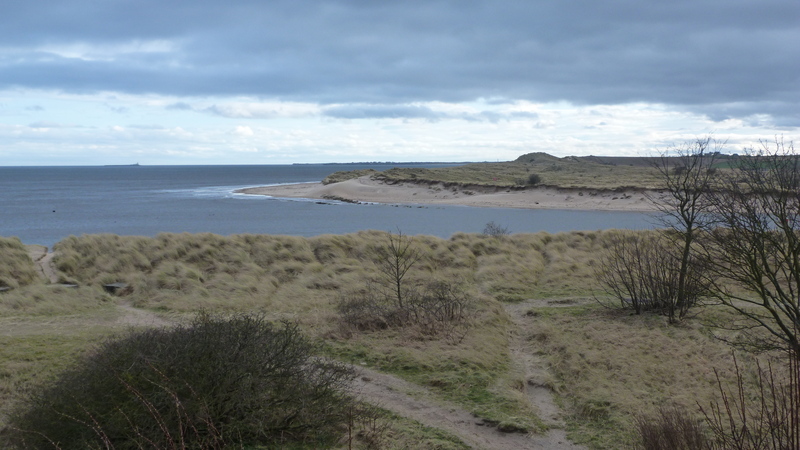 Alnmouth was an important trading port at the mouth of the river Aln. The town was very prosperous in the 18th century when the river was used as a major shipping route for grain and smuggling. In 1748, John Wesley described it as “A small seaport town famous for all kinds of wickedness”. But a huge storm in 1806 destroyed much and diverted the river, changing the fortunes of the town. Today, there is a population of only about 600, none of whom seemed particularly wicked. It surprised me to find sandy dunes in England. The beach was dotted with winkle and clam shells, and smoothly polished natural coal. The wind was fierce, throwing a spray of fine sand in our faces. There is a reason why tourists are not out picnicking on the beach in February. 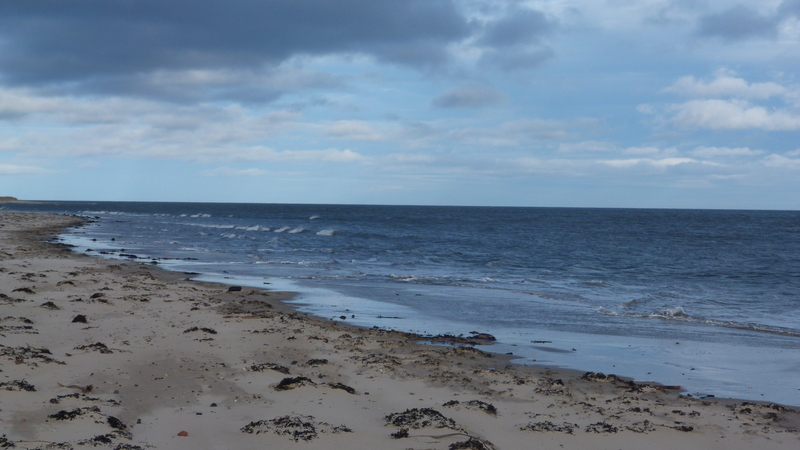 Alnmouth is on St. Oswald’s Way, a 97-mile walking route in Northumberland that stretches from Holy Island to Heavenfield. It sounds like the route that we might take another time, as we continue the search for the perfect place.